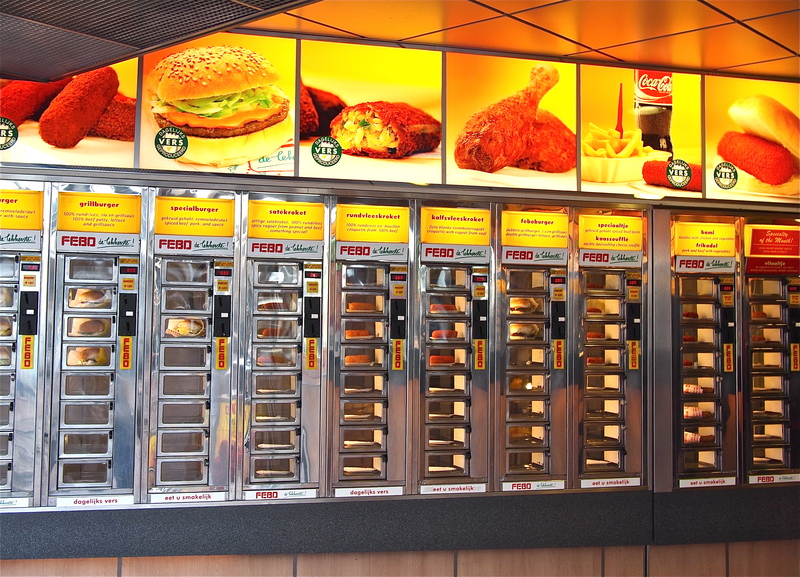 While the Dutch are famous for beautiful architecture and art, their cuisine has suffered a very dark past. Potato porridge, pea soup and carb-heavy plates of lackluster flavor immediately come to mind, making me wonder how a country surrounded by Bocuse D’or winners can manage to remain so behind the culinary times. 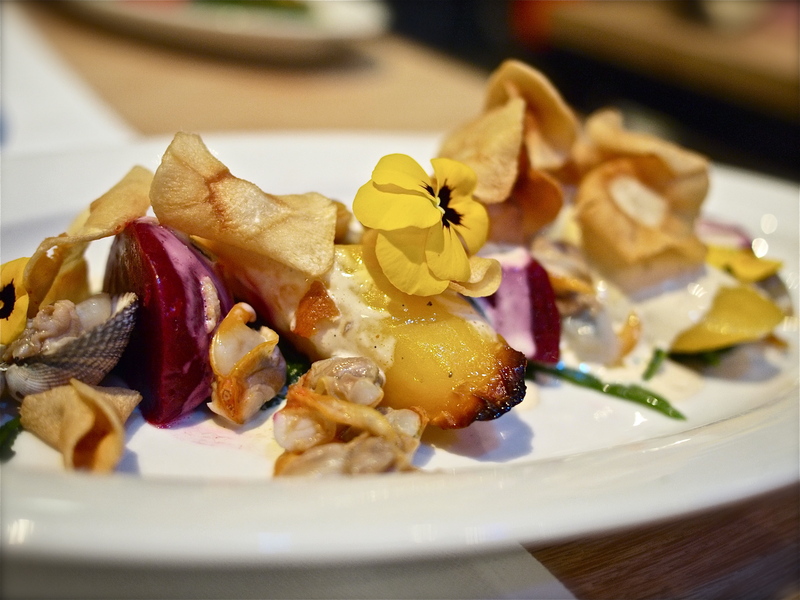 There has been a recent movement toward contemporary Dutch cuisine, with native chefs returning from overseas restaurant stints who incorporate local ingredients with newly learned techniques. 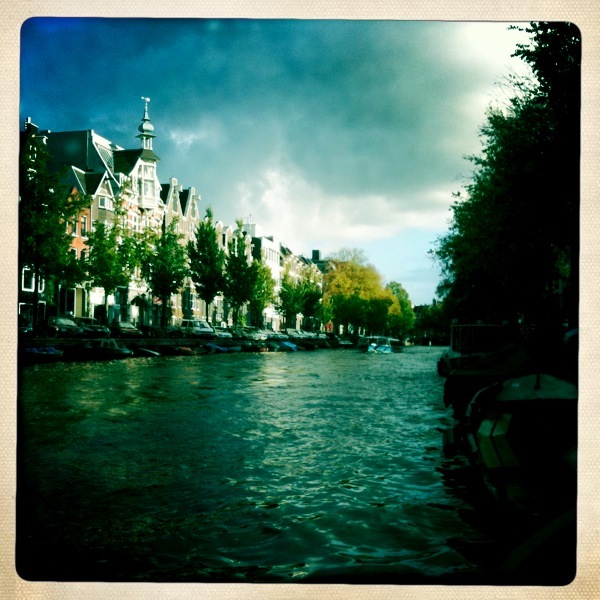 However, I quickly discovered that fine dining in a city so cosmopolitan as Amsterdam, is still not so fine. In keeping with their wonderful sense of artistry and craftsmanship, many restaurants in Amsterdam are true architectural beauties. Dining by candlelight in a reclaimed glass greenhouse in the middle of a park at De Kas, throwing back oysters on a modernized retired ferry at Pont 13 and lunching in the bustle of a former church-turned-bright Moroccan oasis at Bazar all offer exciting backdrops for a fun dining experience. Sadly the food always seemed to fall short of its surroundings, and expat residents generally concurred with my observation. 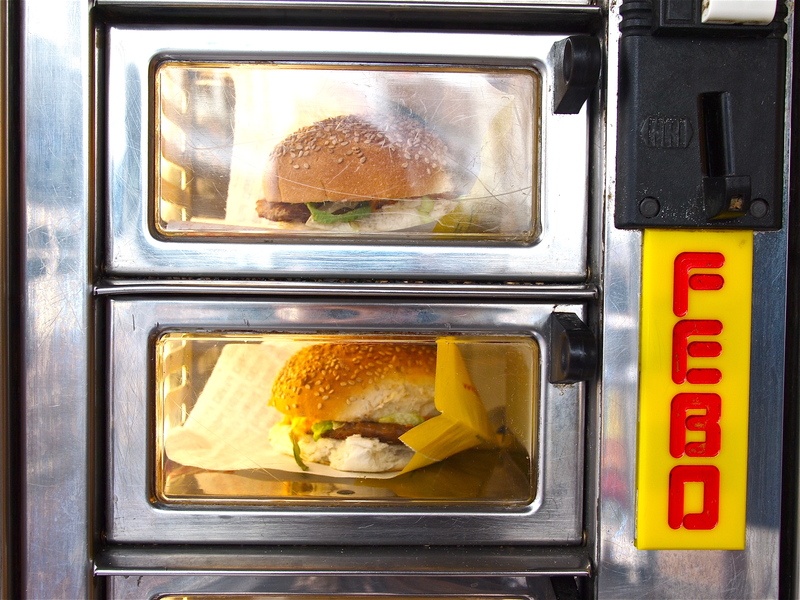 What can we expect from a country whose most popular fast food chain is a glitzed up version of a vending machine? 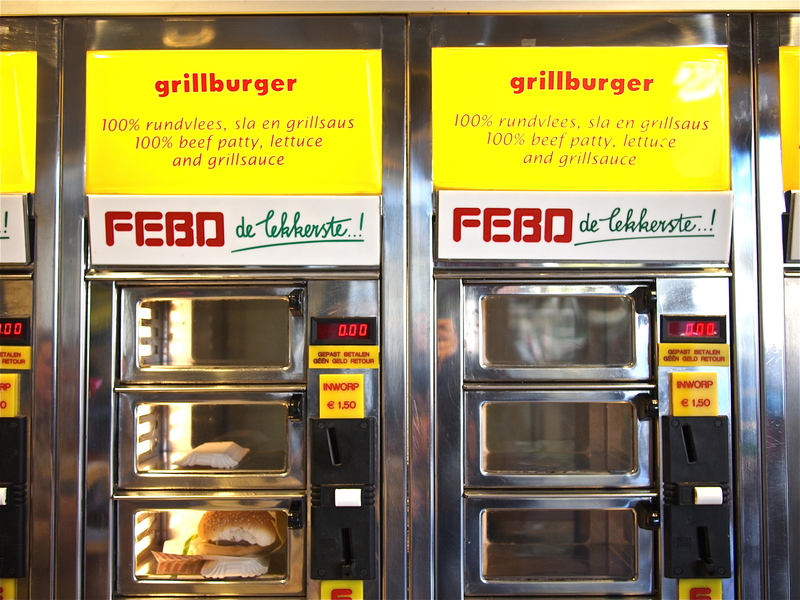 The gaudy red and yellow signs of Febo are visible on every street corner of Amsterdam, dreadful institutions of grease and fat that sell krokets, hamburgers and kaassouflé through small coin operated windows. Bamihaps (deep fried mee goreng), kalfsvleeskrokets (veal croquettes) and frikadels (minced meat hot dogs) that have been sitting in a window for who knows how long simply cannot be good for you. Tourists wandering into any one of the numerous Dutch pancake restaurants will be surprised to find dense heavy cakes smothered in bacon and swamps of melted cheese instead of the light fluffy ones that we are used to. 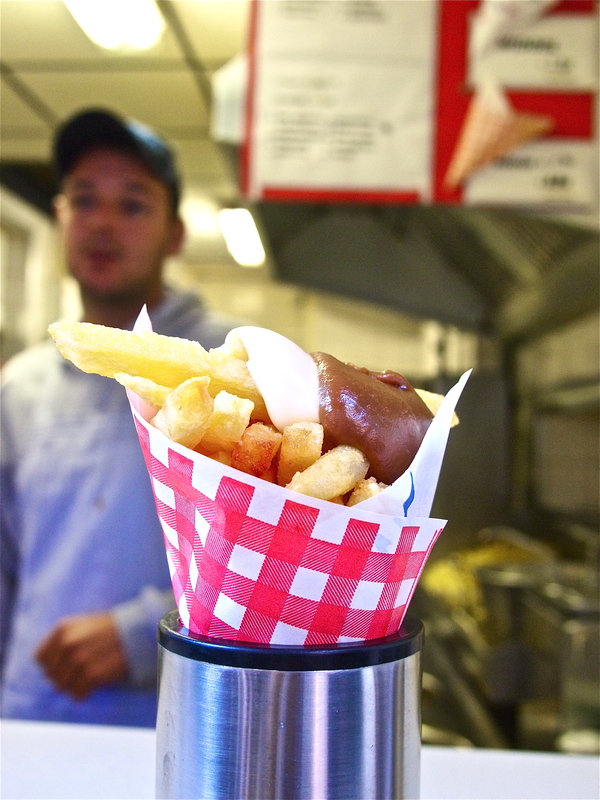 And the Dutch version of Belgian fries are soggy sticks of recycled oil suffocated with awful sauces and toppings. How can one go wrong with fries, I thought, as I waited in a long line at the ever popular Vleminckx, but the signature patatje oorlong (‘war fries’) topped with mayonnaise, spicy peanut sauce and raw onions quickly made it to my list of most disgusting eats. 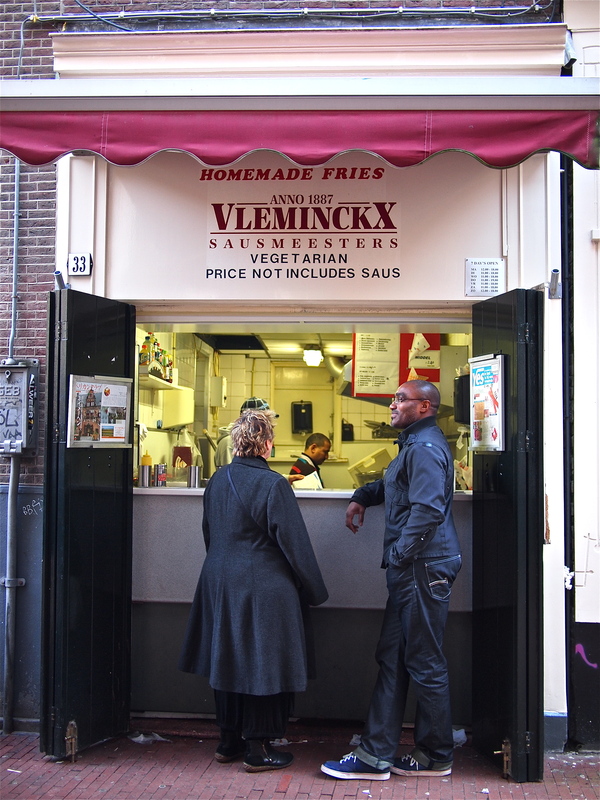 Dutch dining, at least in restaurants and street corners, seemed to emphasize grease and density over flavor and quality. 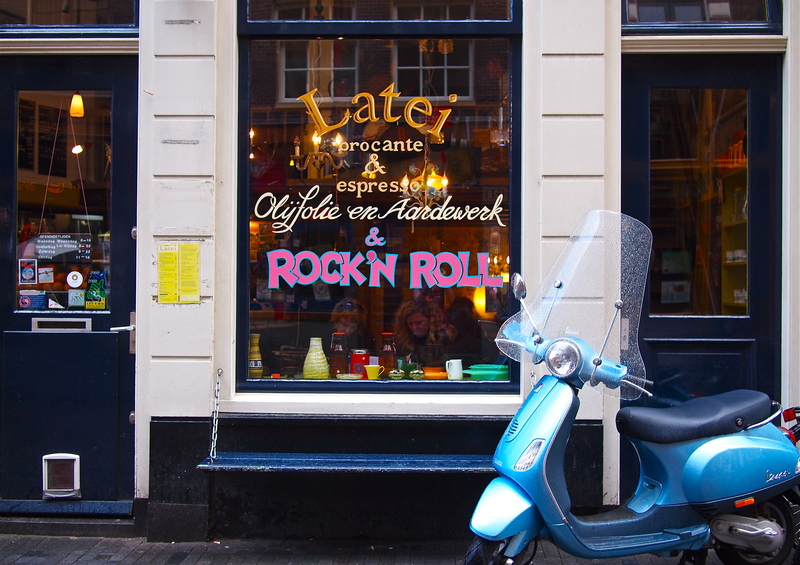 Amsterdam is a melting pot of cultures, and Dutch cuisine gets its much needed boost of flavor and energy from the Surinamese, Turkish, Moroccans, Ethiopians and Indonesians. With an array of Indonesian restaurants to choose from, one can retreat for a rijsttafel rice table extravaganza when their palates tire of bland food. 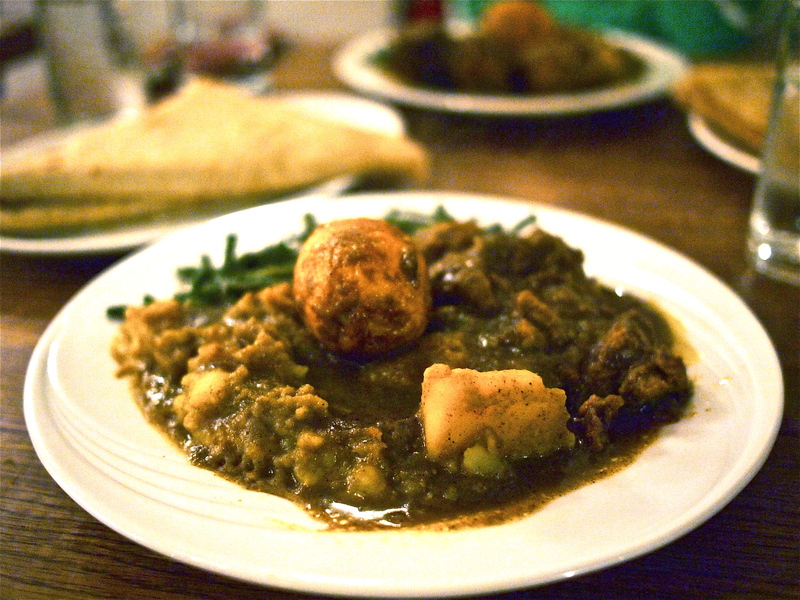 Flaky buttery Surinamese rotis with duck curry and crispy green beans will also please the weary traveler. 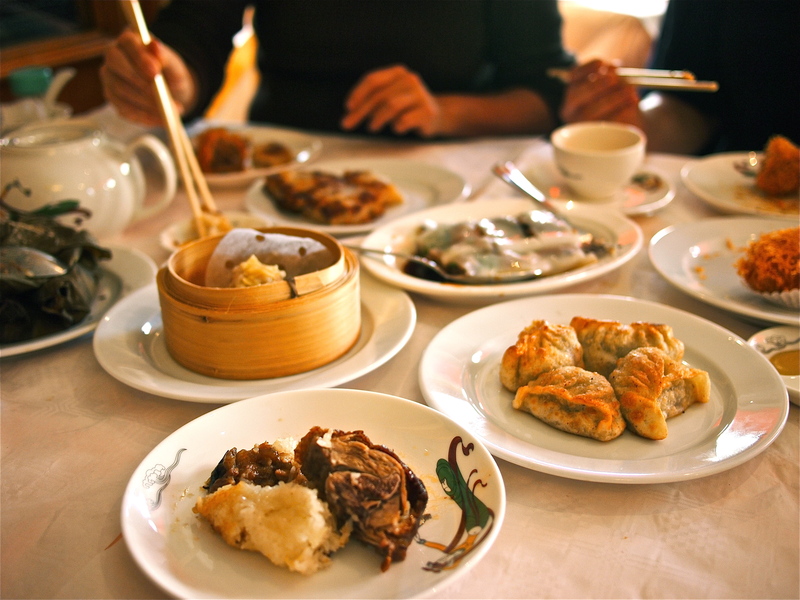 Chinese dim sum on a lazy Sunday morning at Oriental Palace in Chinatown is another palatable dining option. Pork siu mai, shrimp har gow, pan fried jiaozi, shrimp cheong fan, lotus leaf wrapped sticky rice, taro dumplings, turnip cakes and squid in black bean sauce are as good as any dim sum parlor in the US. But I didn’t come all the way to Amsterdam just to eat Chinese dim sum and Surinamese rotis. 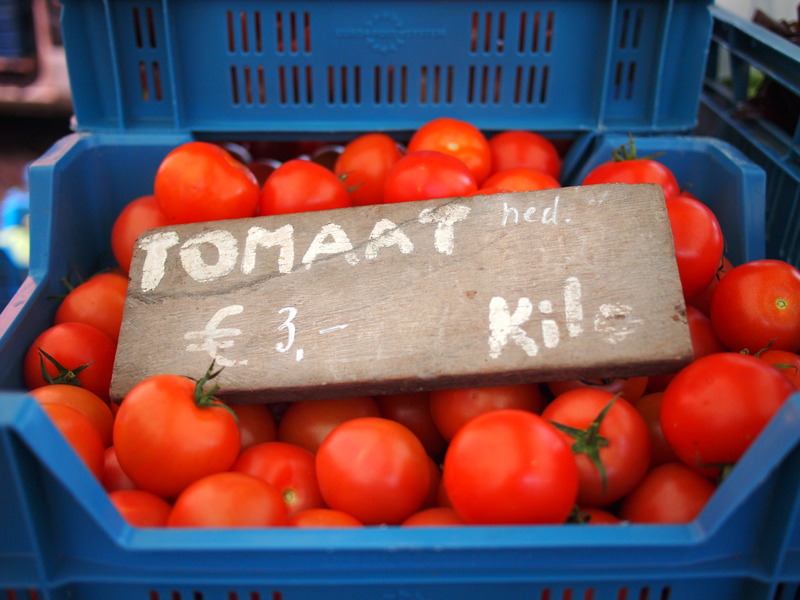 What exactly is Dutch cuisine, and how can I eat well in the Netherlands? After some investigation and a lot of observation, I started to realize that the majority of locals stay at home and cook. Dining out isn’t a big part of their culture, and the best meals are prepared at home using ingredients from local food shops, markets and delicatessens. 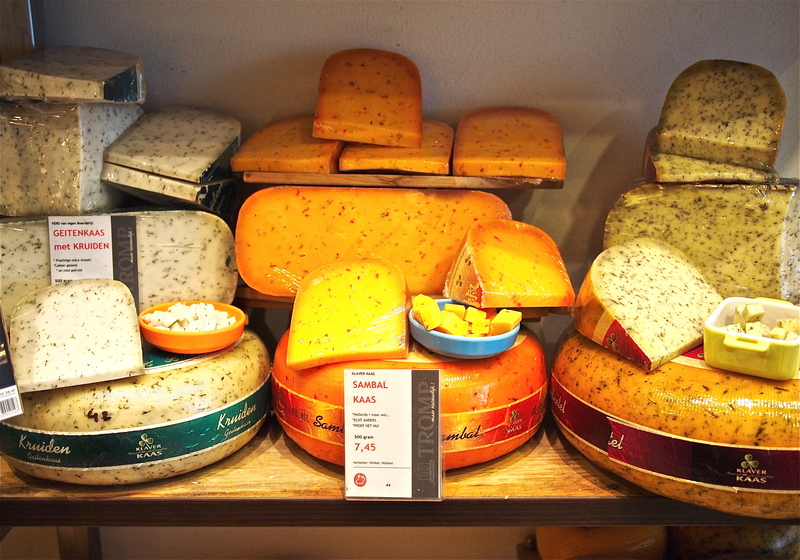 Take Kaashuis, a specialty cheese store filled wall to wall with artisanal goudas, Edam and Leyden. 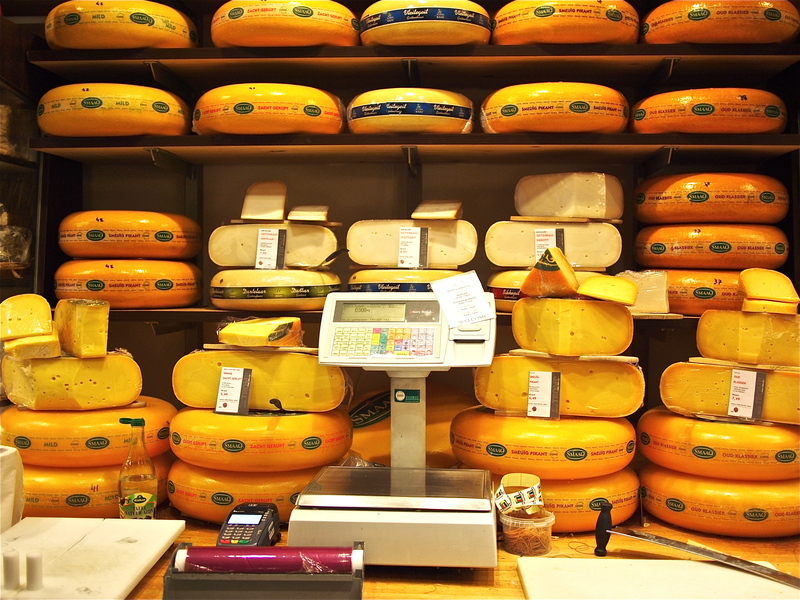 The Dutch are as famous for their cheeses as they are for their windmills and wooden clogs, and with over 200 domestic and imported cheeses to choose from along with a smorgasbord of marinated olives, roasted tomatoes, beautiful breads and cured meats, one will never have a bad meal anymore. Immediately next to Kaashuis is a butcher shop offering everything from housemade sausages hanging from the ceiling, pickled beef tongue, venison pâté, rabbit rillettes and a glorious hock of Jamón Iberico to shave. 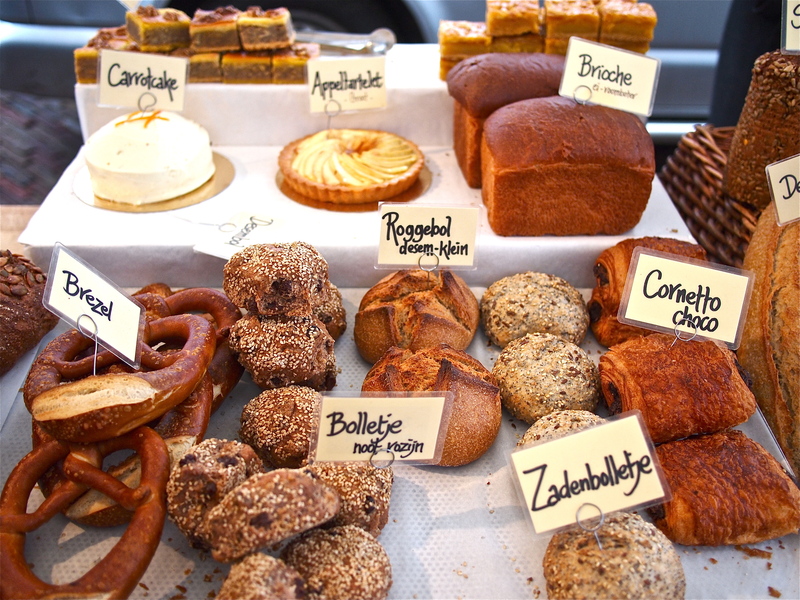 Across the street from the butcher is a gorgeous sweets shop called Patisserie Kuyt bursting with the warm enticing scents of freshly baked pastries and biscuits. 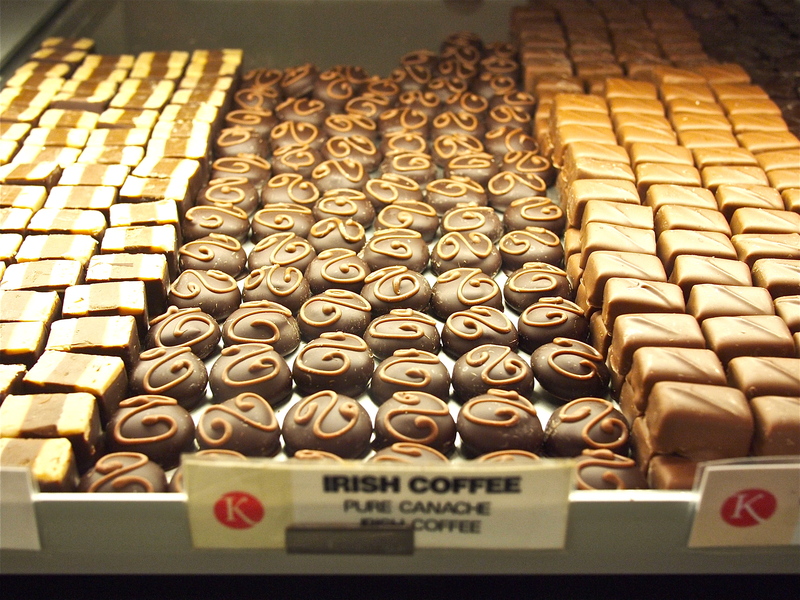 The glass window cases are filled with sheets of dainty little chocolate ganaches, bonbons and decadent cakes. 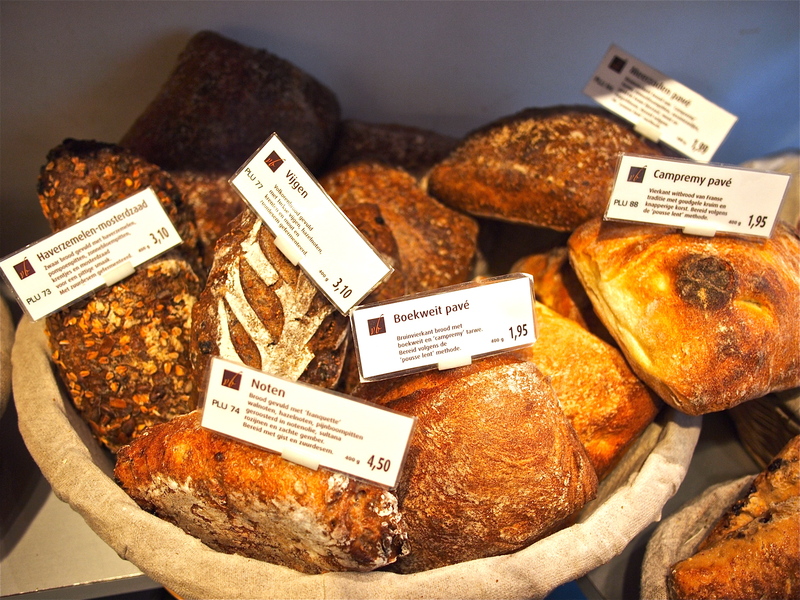 Just a few stores down from Kuyt, like in any other neighborhood in the city, is a bakery selling baguettes, croissants, sourdough loaves, dense hearty rusks and various artisanal breads. 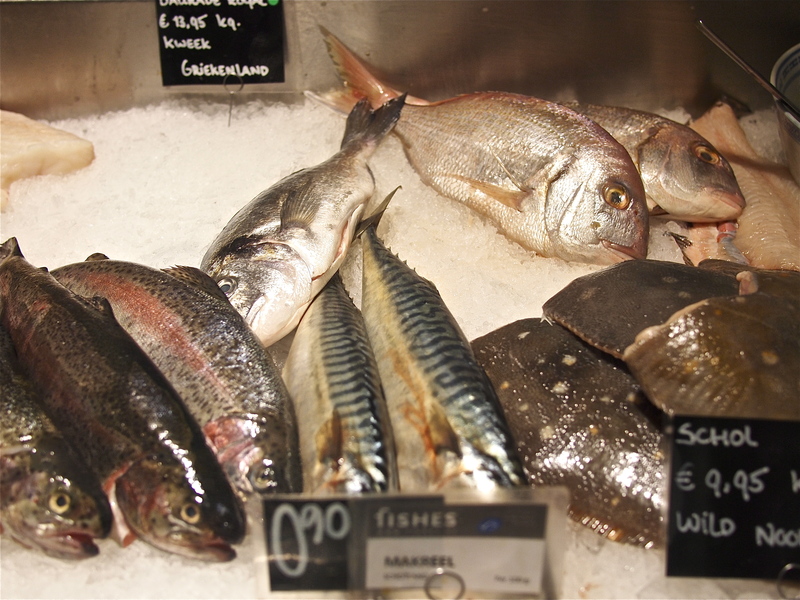 Perhaps the best part of shopping and eating in Amsterdam is the fresh seafood. Close to Kaashuis and Patisserie Kuyt is a quaint little store called Fishes, offering the most beautiful selection of fish, cephalopods, mollusks and bivalves for a reasonable price. Smoked eel, mackerel and salmon, all delightful Dutch specialties, are as good as it gets here in this clean and well organized shop. 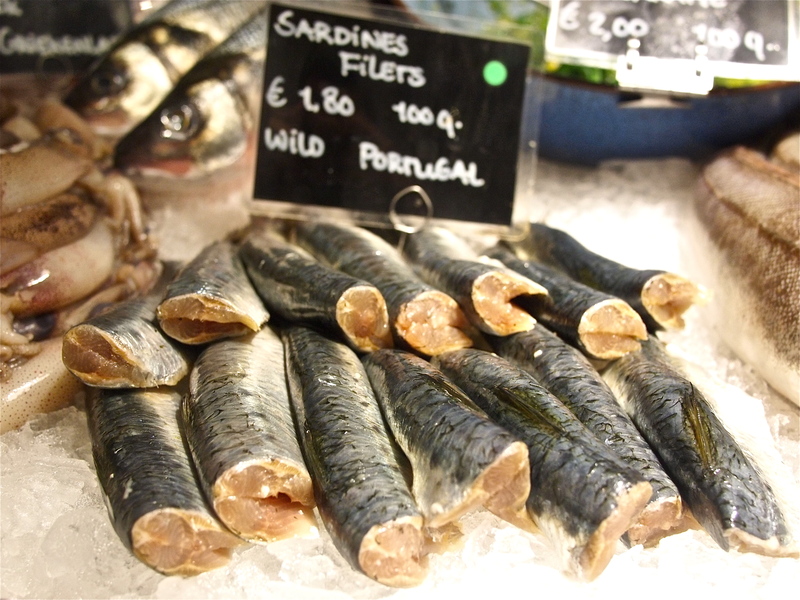 And what about raw herrings, those shiny slippery fish that the Dutch so love and adore? 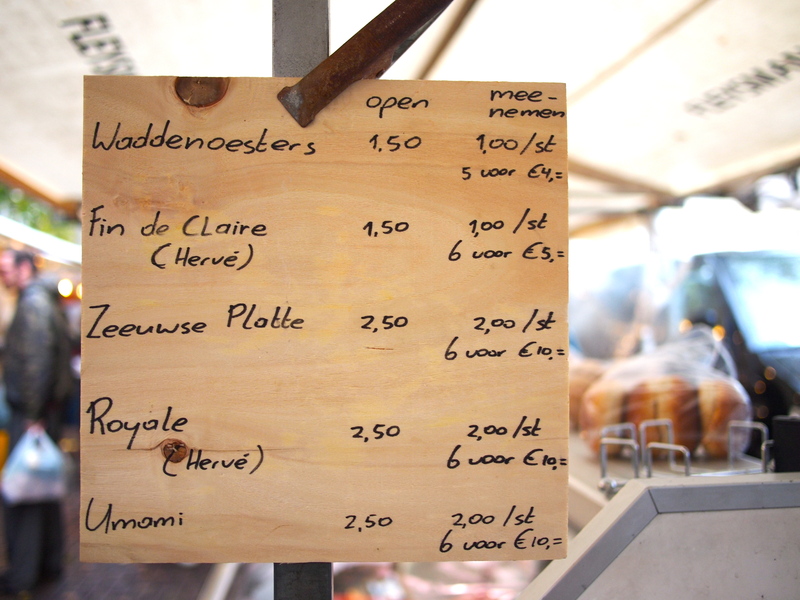 Herring stands can be found at any outdoor market and along the canals, crowded with locals who stop in for a quick snack, but after numerous samplings of these succulent treats across the city, I found the best ones at Fishes. Here you won’t have to deal with rude herring-meisters who treat you like the tourist that you are, but will be welcomed by the generous staff who run this clean joint. 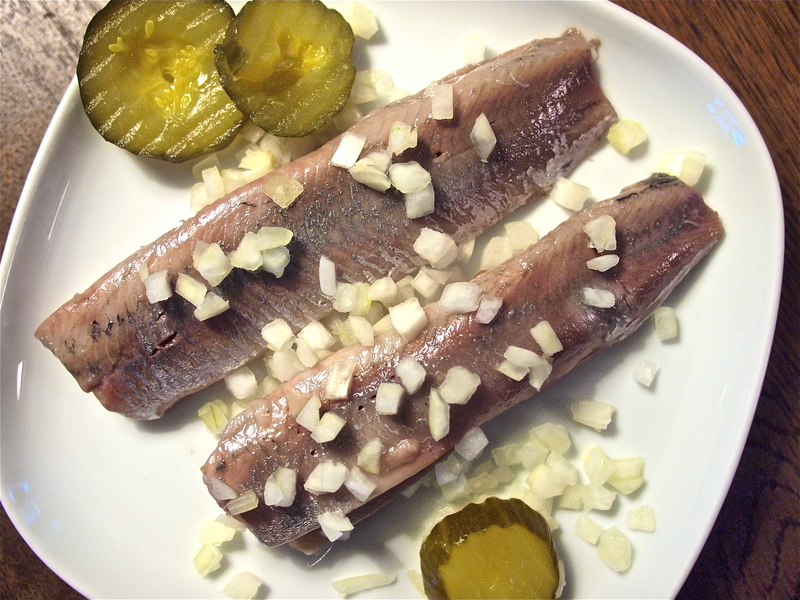 Herrings are best enjoyed during the early summer months when its flesh is at its sweetest, but even when I was there in the winter, they were oily, plump, tender and sweet, hardly requiring the chopped onions and gherkins that come as accompaniments (in fact, purists scorn their presence). 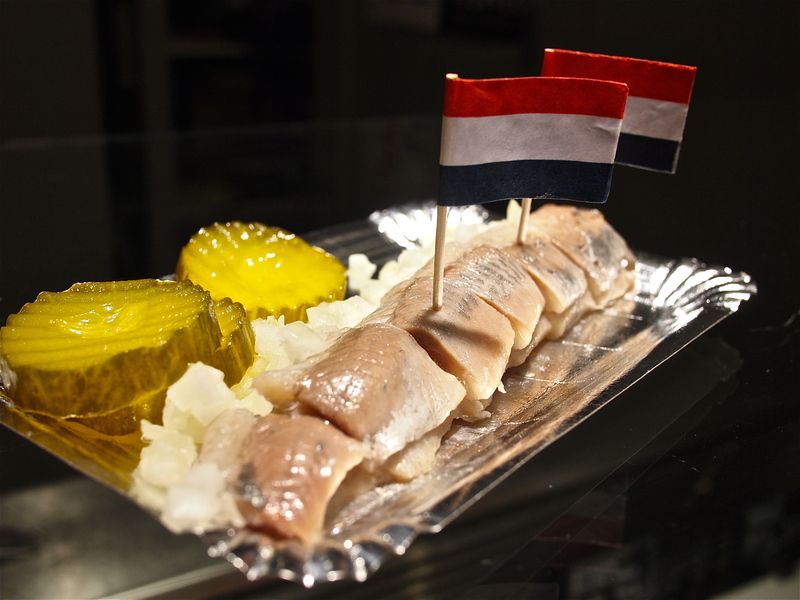 Hold the herring by its tail, tilt your head back and slide the whole fish down your throat as the Dutch do, or cut it up in bite sized pieces and eat it with a Dutch flag toothpick if you’re shy. 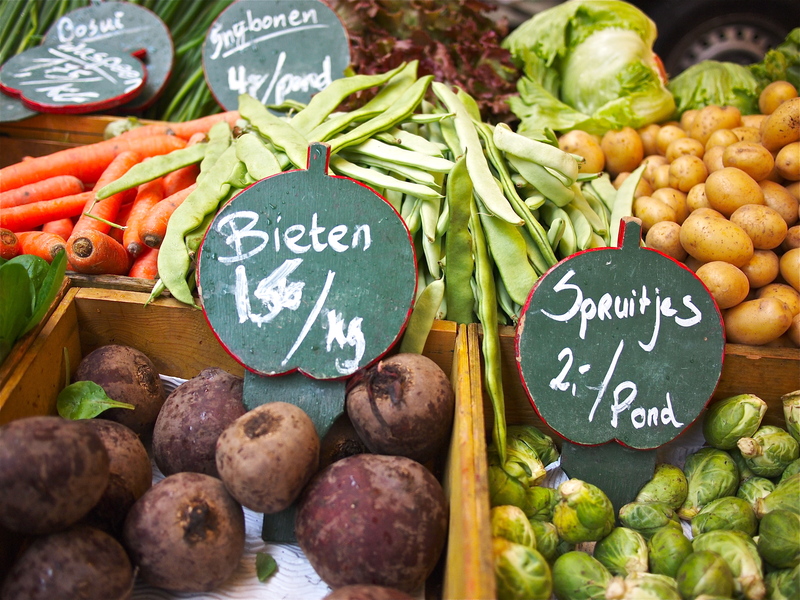 With easy access to the most wonderful specialty products in the neighborhood, coupled with fresh organic produce from the Noordermarkt farmers market, we were soon eating like royalty in our cozy apartment. It didn’t make sense to throw away our Euros for consistently disappointing and appalling dining experiences. Short of being invited to somebody’s house for a home cooked meal, this was the most economical, pleasant, delicious and sane way to enjoy ‘Dutch dining’. 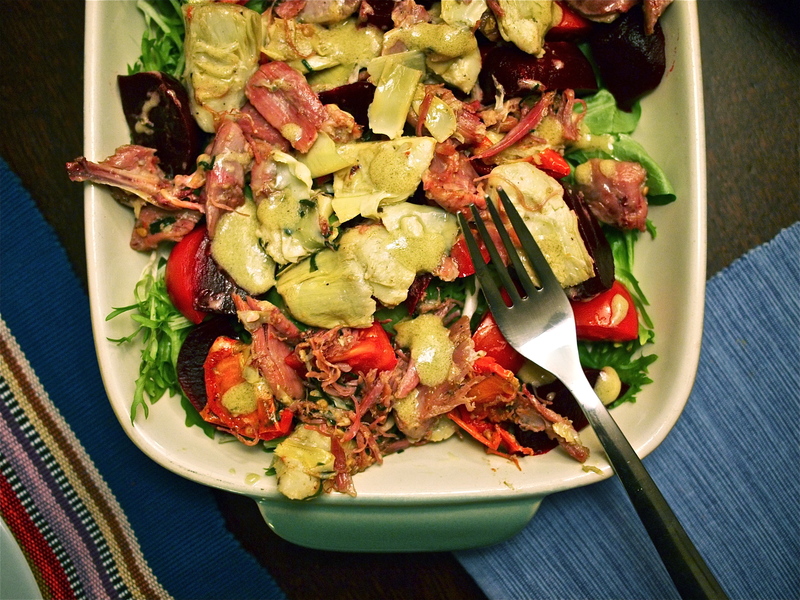 Like a duck confit salad on a bed of organic baby greens, steamed artichokes, roasted red beets and tomatoes with a mustard vinaigrette. 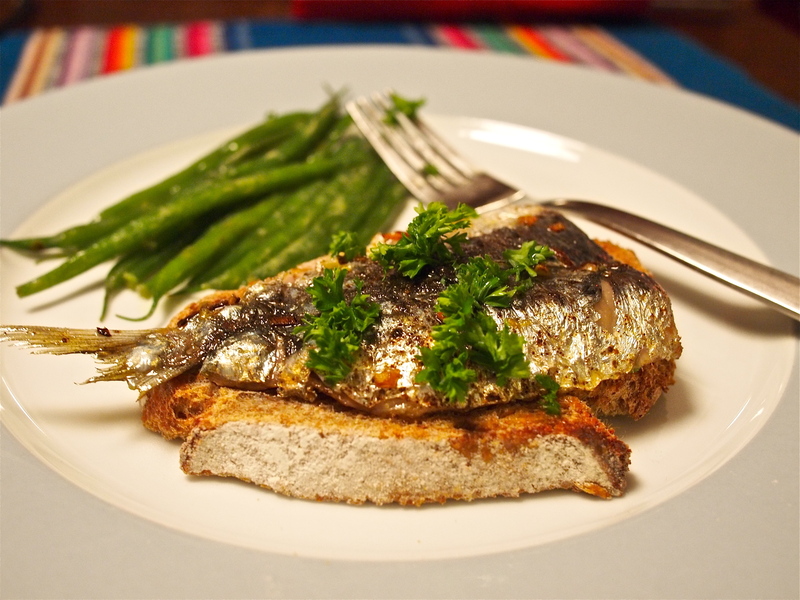 Or fresh sardines from Fishes, pan fried in olive oil and dressed simply with salt and chopped parsley on toasted rusk. 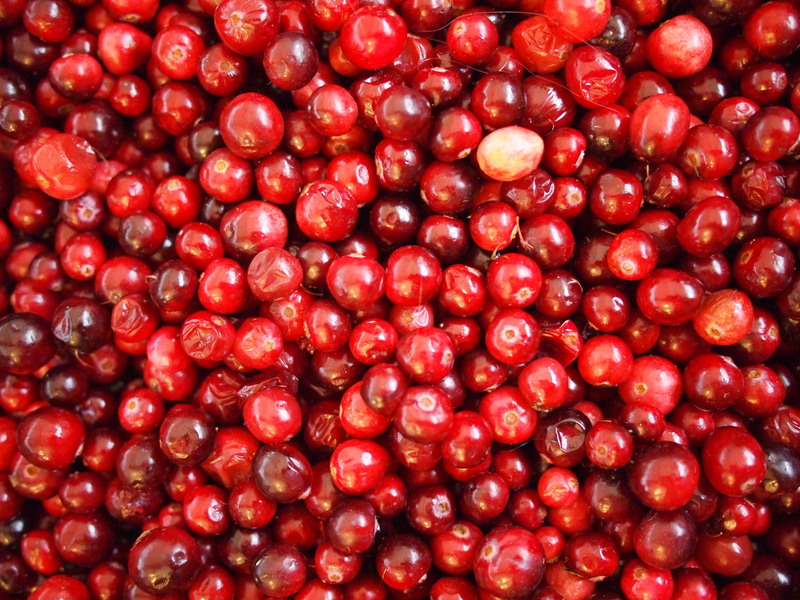 Ingredients so fresh, so flavorful and incredible that they speak for themselves. 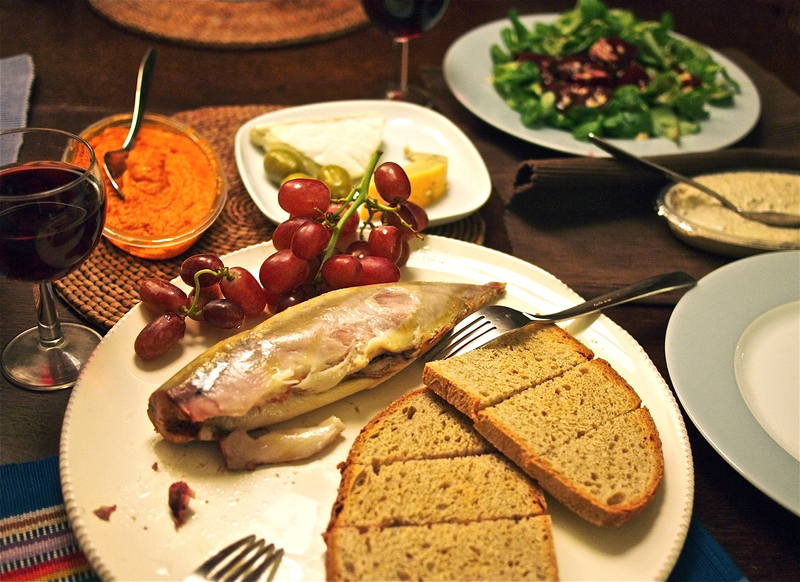 Whole smoked mackerel quickly became my favorite daily eats, with toasted rusk, fresh mâche salads, organic fruits, artisanal cheeses from Kaashuis and a bottle of wine. Melt-in-your-mouth smoked salmon from Fishes made it on the breakfast table every morning, while pickled beef tongue, smokey and slightly chewy in the best possible way, was another shining star in our daily routine. 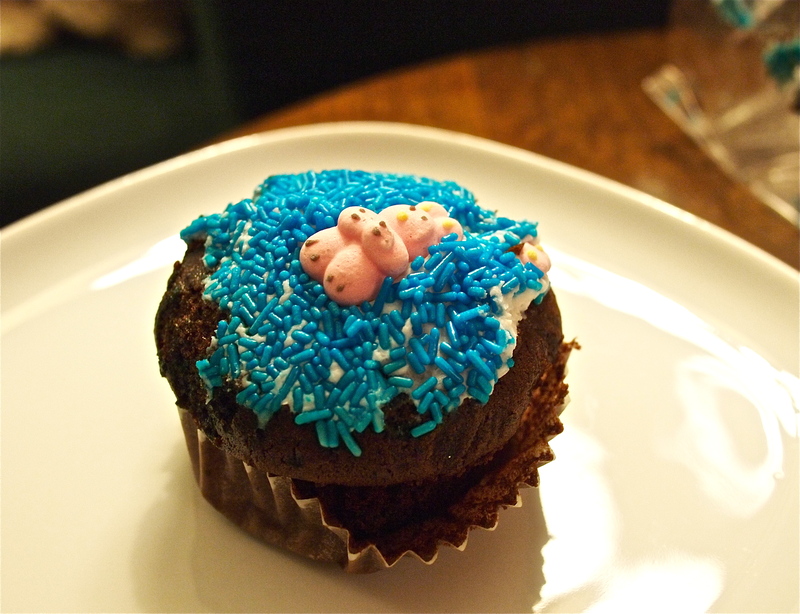 When all else fails, there’s always chocolate space cakes, moist buttery snacks that taste innocently sweet. Of course, you’ll still have to prepare some food for those outrageous munchies that will follow. Random trivia: Did you know that splitting a restaurant bill and ‘going Dutch’ comes from the concept of a Dutch door which is split horizontally in the middle so that the bottom half can stay shut to keep farm animals out, while the top half can remain open to let air in? 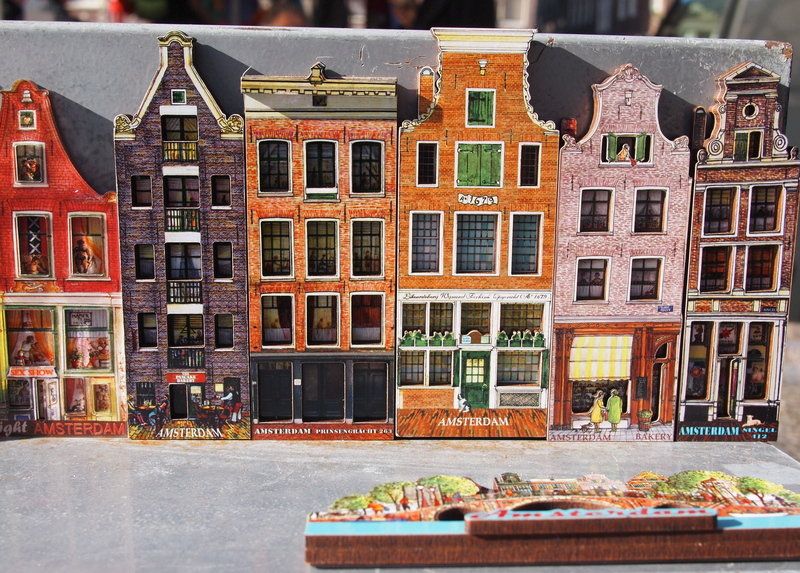 The intricate canals of beautiful Amsterdam run through all of the historic neighborhoods and marketplaces, lined by leaning rows of tall narrow houses stacked side by side. What better way to spend a warm lazy Sunday afternoon than to take a leisurely stroll admiring this unique architecture and discovering the city. 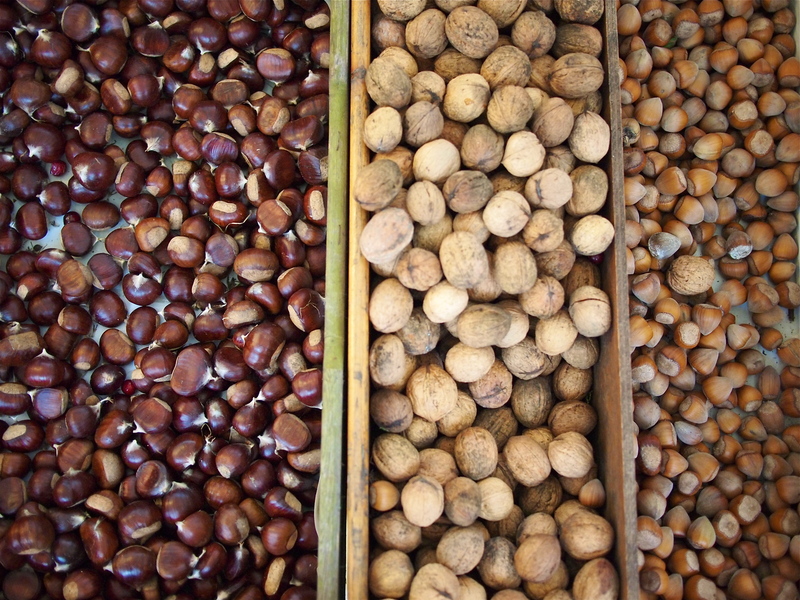 Weekends are an especially good time to explore outdoor markets and bazaars on foot or on bicycle, the preferred mode of transportation in the city. 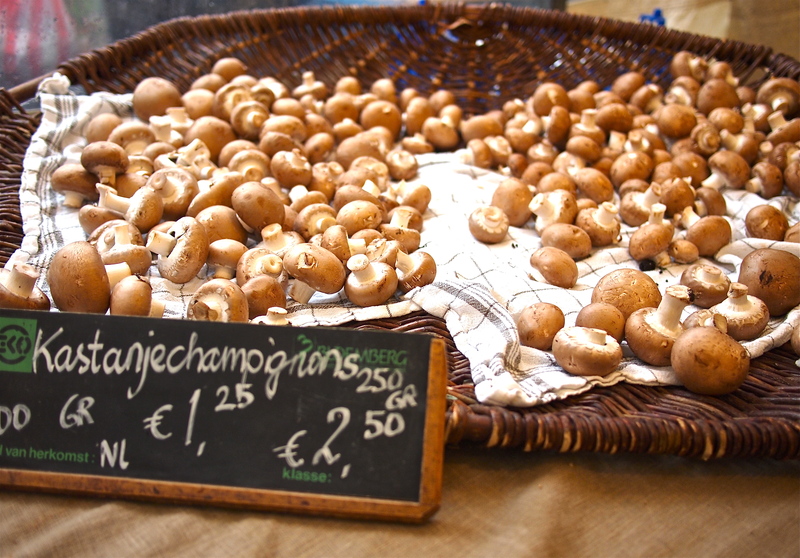 At the edge of Amsterdam’s famous Red Light district, leading into Chinatown, is Nieuwmarkt which means ‘new market’. 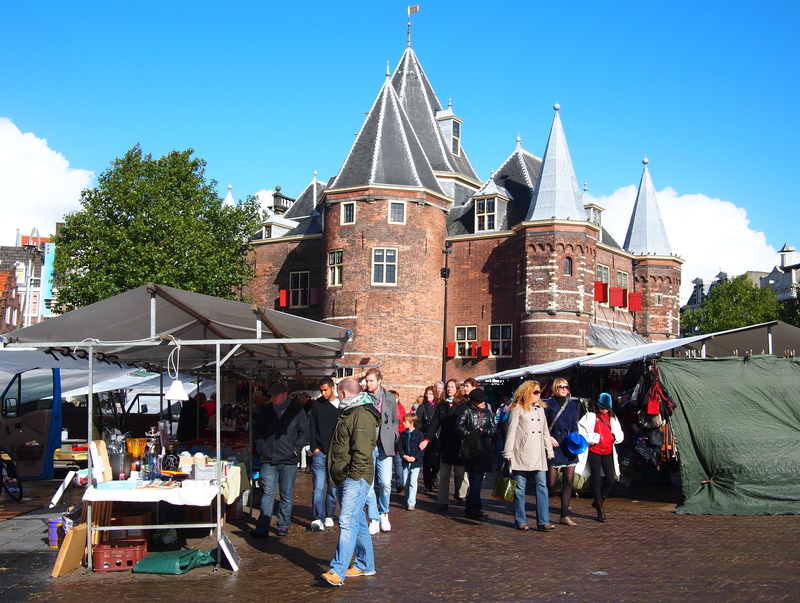 A majestic building called De Waag, originally a gate leading into the Medieval city wall and later functioning as a weighing house, stands tall in the center of the square as Nieuwmarkt’s landmark. 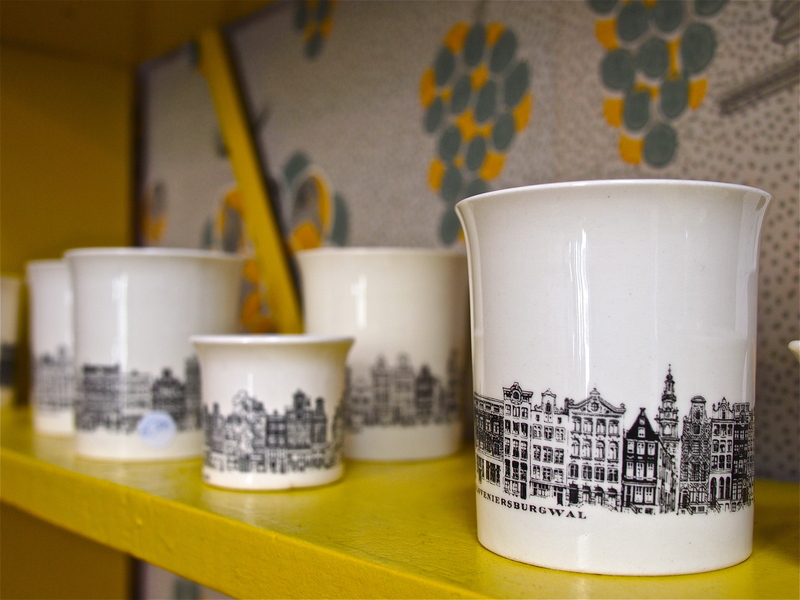 On Saturdays Nieuwmarkt is a bustling farmers market, and on Sundays it comes alive as an antiques market where one must rummage through a lot of junk to find those rare treasures. 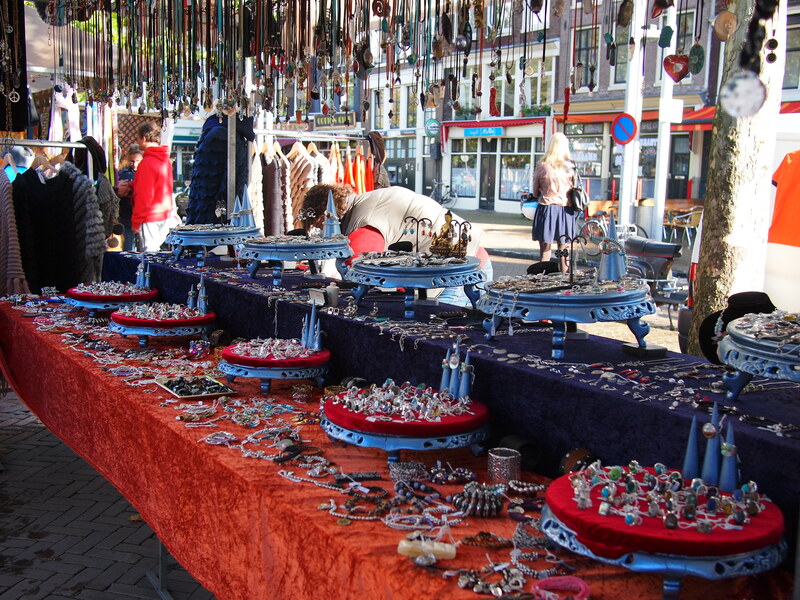 More than antiques there seems to be a lot of random clothes, boots, jewelry and souvenir stalls at Nieuwmarkt, but it’s still a fun way to spend an afternoon with friends before stopping in to any of the restaurants and cafés in the square. With such a peaceful and laid back atmosphere, it’s hard to believe that during World War II the square was used by the Nazis as a collection point for Jews who had been rounded up to be sent to concentration camps. 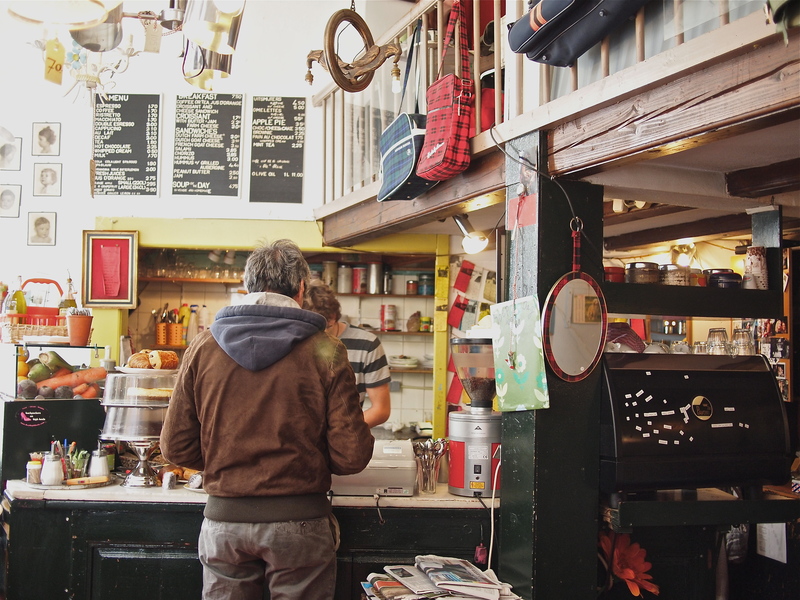 A perfect place to take a break after browsing at Nieuwmarkt is Latei, a quaint and lovely little café where you can sip on cappuccino while continuing your afternoon of flea market shopping. 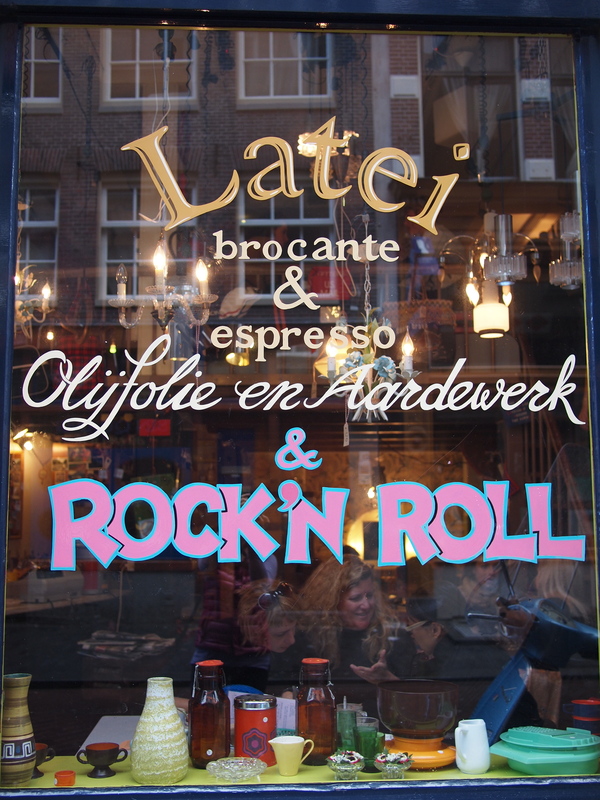 Virtually everything in the restaurant, except for the servers and customers (even though it’s close to the Red Light district), are for sale. Stepping into Latei is like going through the wardrobe in C.S. 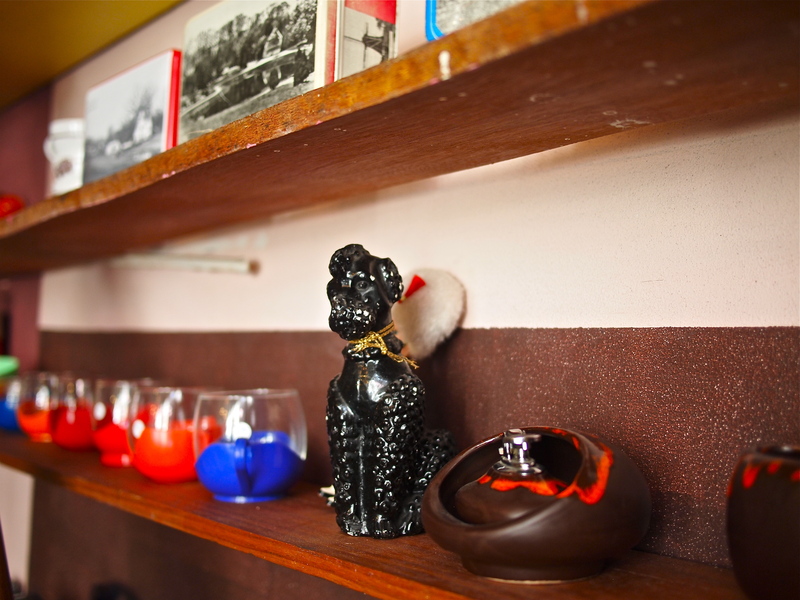 Lewis’ famous Chronicles of Narnia into a magical attic of beautiful knick-knacks. 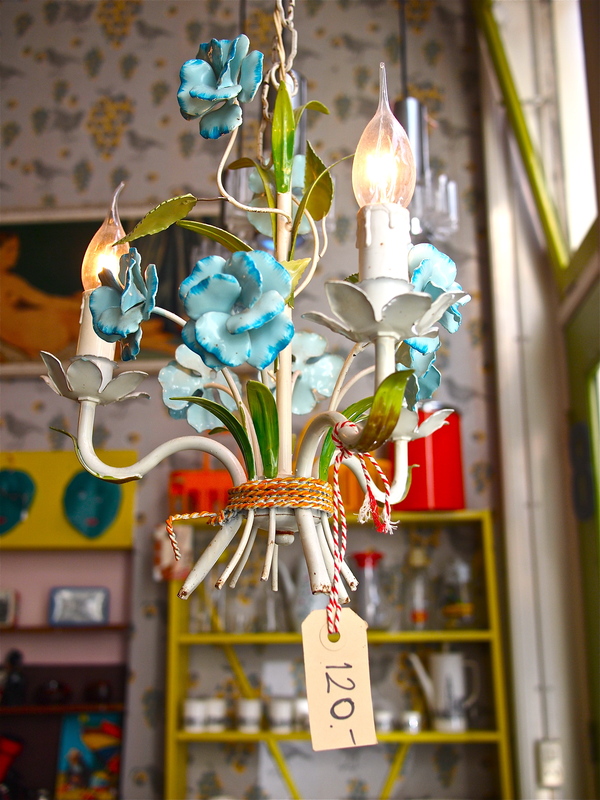 Delicate vintage chandeliers crowd the ceilings, each with a handwritten price tag dangling from a draping handle, while colorful travel bags, decorative mirrors, dated posters and random toys stud every inch of wall space. Order a warm croissant with butter and jam to go with freshly squeezed orange juice for breakfast while reading the day’s issue of De Telegraaf, or sink your teeth into the Dutch goat cheese sandwich with a side of soup for lunch at the small table by the large window which is optimal for people watching. On Thursdays, Fridays and Saturdays they also serve vegetarian Indian food for dinner. 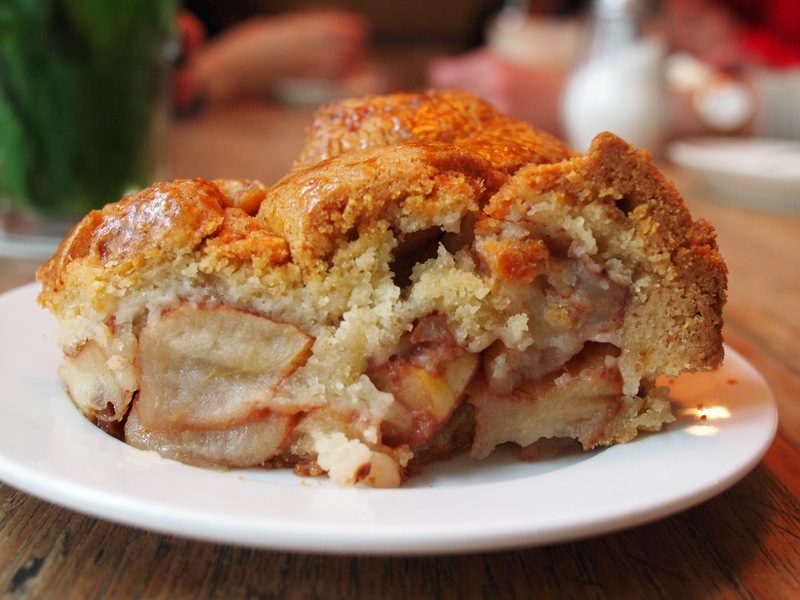 Finish off your meal with a satisfying wedge of warm Dutch apple pie with a shot of espresso or a cup of hot chocolate. 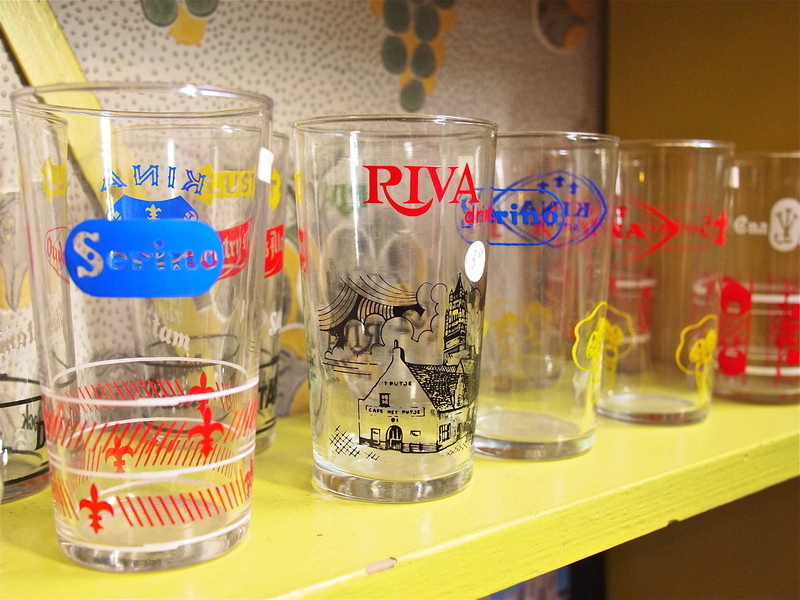 All of this eating and drinking is, of course, part of test driving Latei’s tableware to see if it’s something you want to buy and take home. 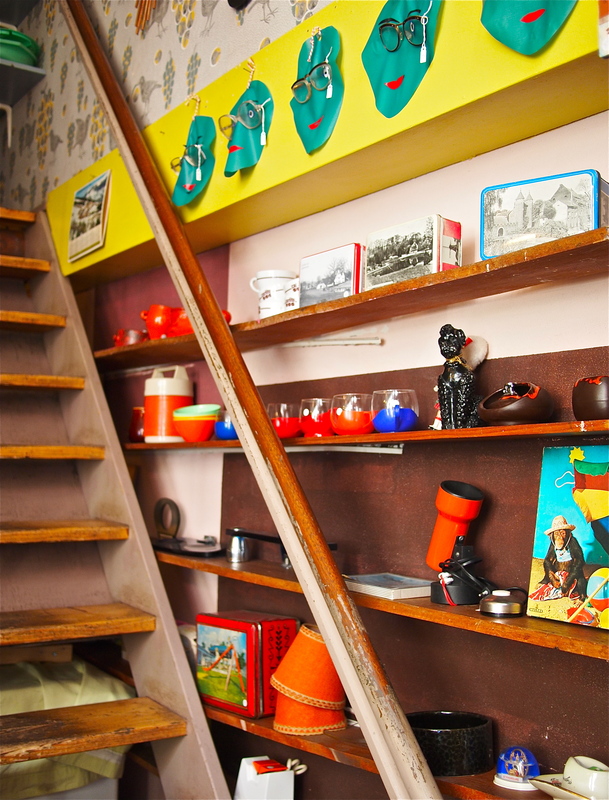 Whether upstairs in the little loft or down under the staircase in the semi-private den, every nook and cranny in this small café is filled with fun stuff- second hand furniture that may include creaky wooden chairs and red leather banquettes from a bygone diner, kitschy eyeglasses displayed on cut out green paper faces, and even a shiny silver disco ball scattering little specks of light onto the vintage wallpaper. 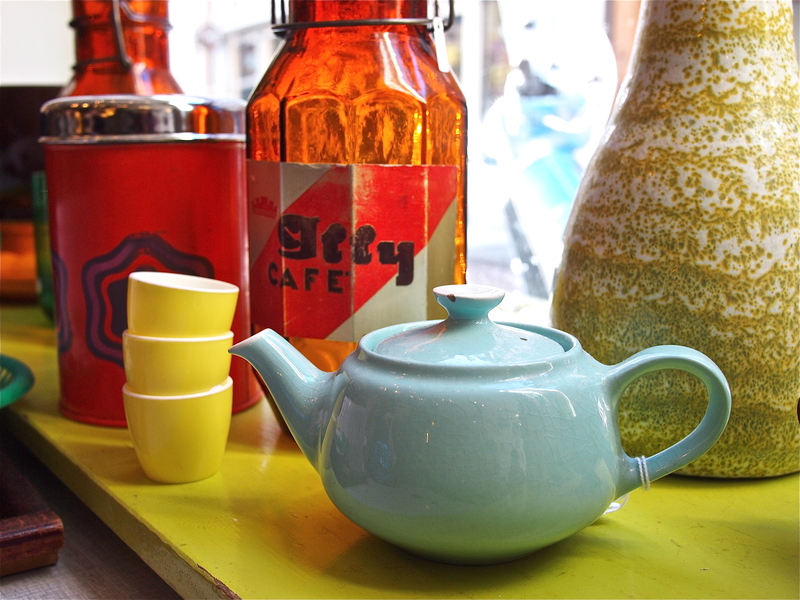 Everything has a price tag at Latei, but even if you leave empty handed, a lazy afternoon spent at this wonderful café debating everything from world politics to celebrity gossip with friends over apple pie and coffee is priceless. 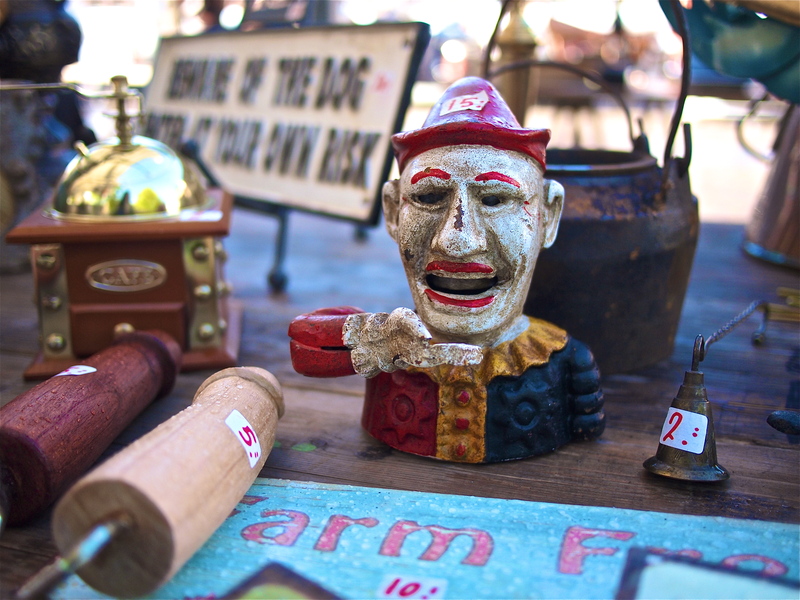 Random trivia: Did you know that ‘antiques’ are defined as objects that are at least 50 years old? 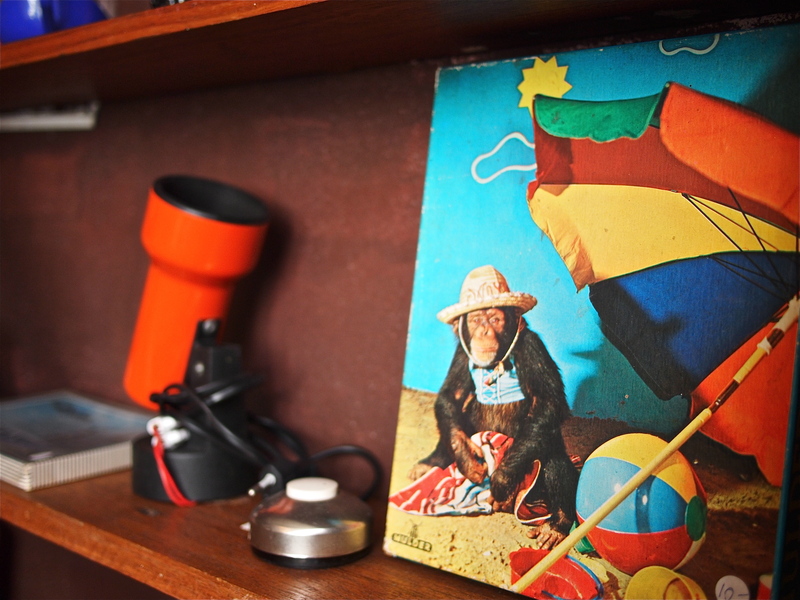 ‘ Collectibles’, on the other hand, are possible antiques of the future and are generally less than 50 years old. 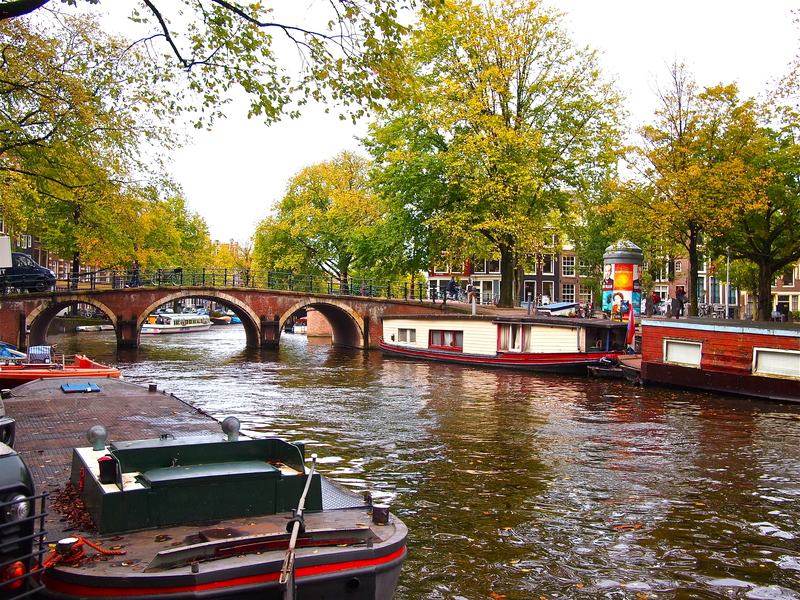 Amsterdam boasts 12 daily outdoor markets and 15 markets that are open one or two days of the week, spread across the beautiful city that is built around picturesque canals. 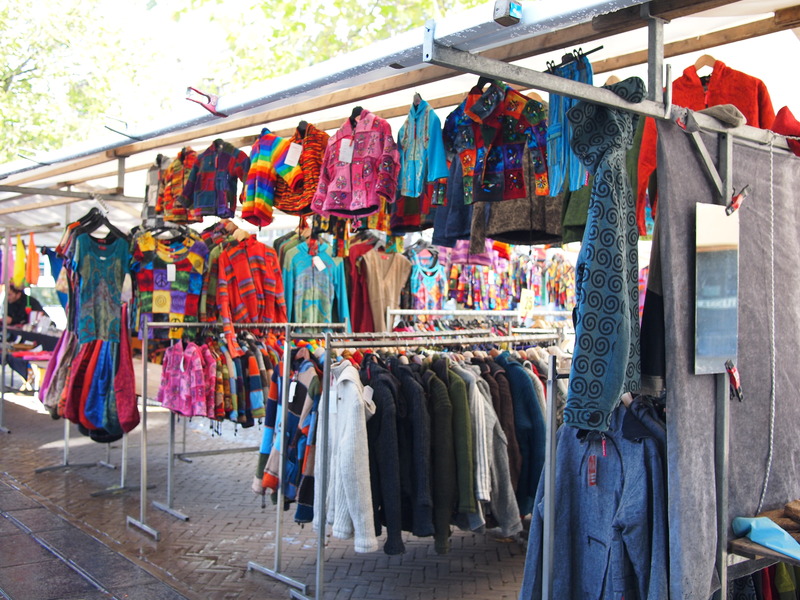 At the Waterlooplein Flea Market one can find second hand clothing, while vintage trinkets and exotic spices can be haggled over at the largest market called Albert Cuypmarkt. Perhaps the most photographed market in Amsterdam is the Bloemenmarkt, the only floating flower market in the world, housed on a long succession of boats on the Singel canal where one can enjoy tulips of various colors, even a rare black type. 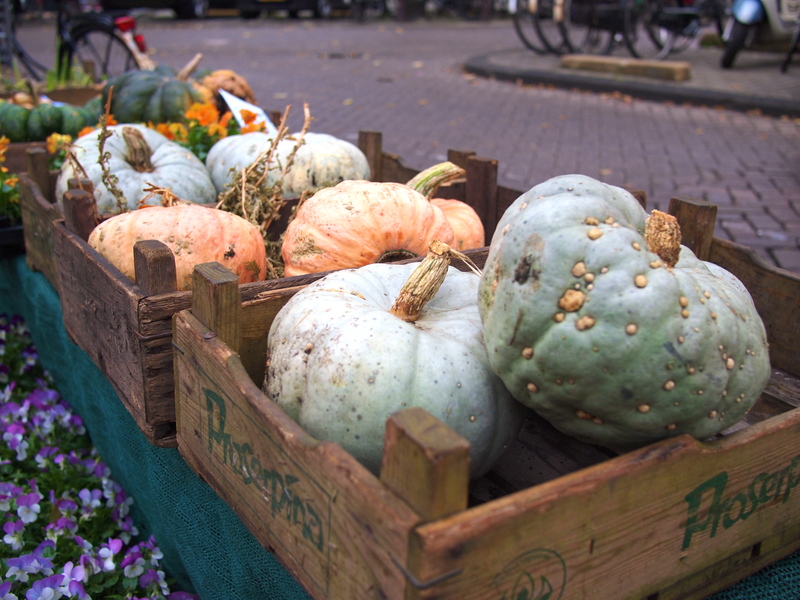 On a wet autumn Saturday morning, I did as the locals did and rode my bicycle, holding an umbrella in one hand and wearing a big rain poncho, to the Noordermarkt organic farmers market in the Jordaan district to secure my week’s supply of greens and bread. Noordermarkt, which means Northern Market, dates back to 1616 and was originally named Prinsenmarkt after the nearby Prinsengracht canal that runs along the length of the city. In 1623, a large church called Noorderkerk was built in the town square, and for many years the current market site was used as a graveyard. 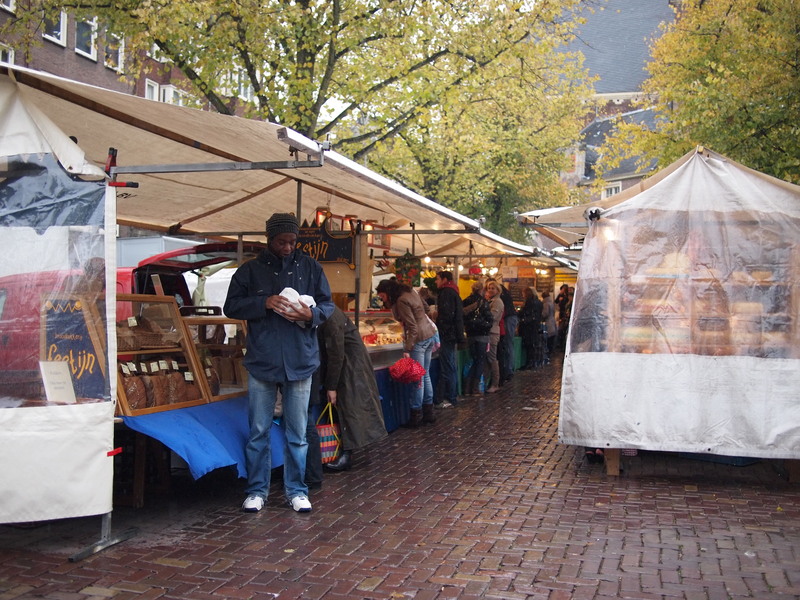 Eventually the market was revived and it took on the name of Noordermarkt to commemorate the holy landmark. During World War II, the Noordermarkt square became the site of the February Strike, the first public protest of non-Jewish citizens against the deportation of Jews by the Nazis. 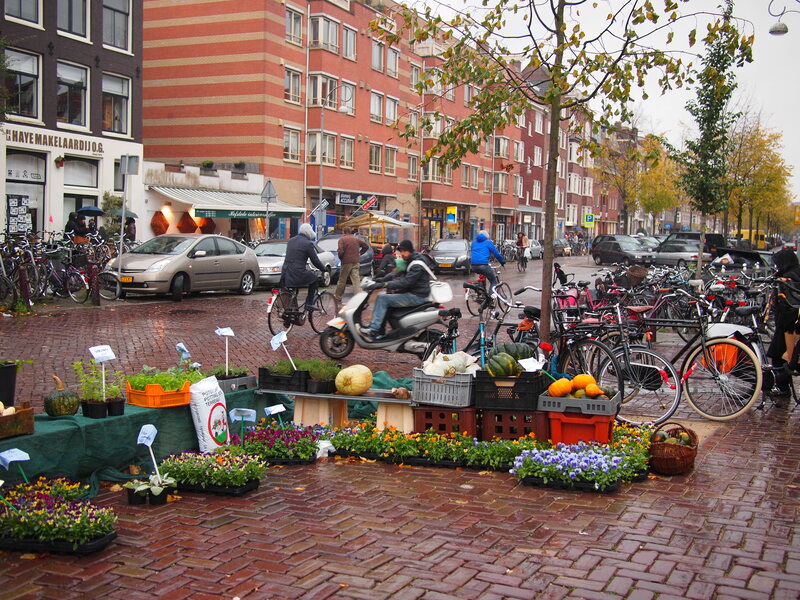 Now it is a peaceful and beautiful square lined by posh cafés and restaurants, coming alive on Saturdays as the only organic farmers market in the city. 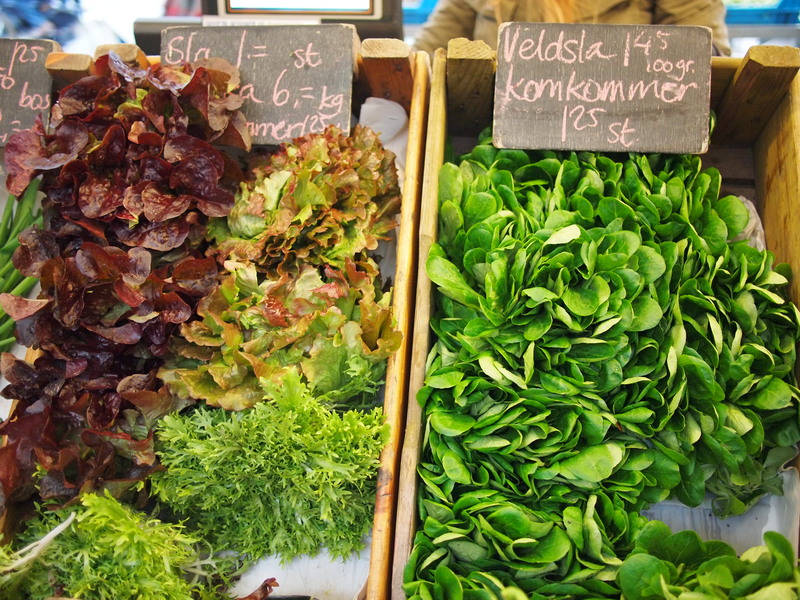 I started filling my wicker basket with plump tomatoes, hefty beets, salad greens and fresh herbs while chatting with the vendors about how best to prepare them. Despite the rain, the market was bustling with people from all walks of life who were enjoying this weekend tradition as much as I was. 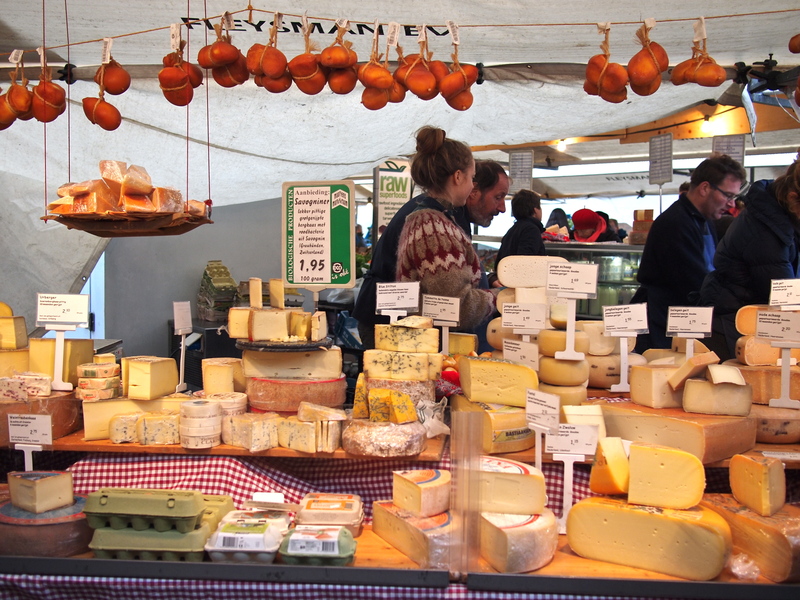 Vibrant colors of ripe fruits and vegetables filled each stall, and alluring aromas of freshly baked breads and cheese samples drew me in from all directions. 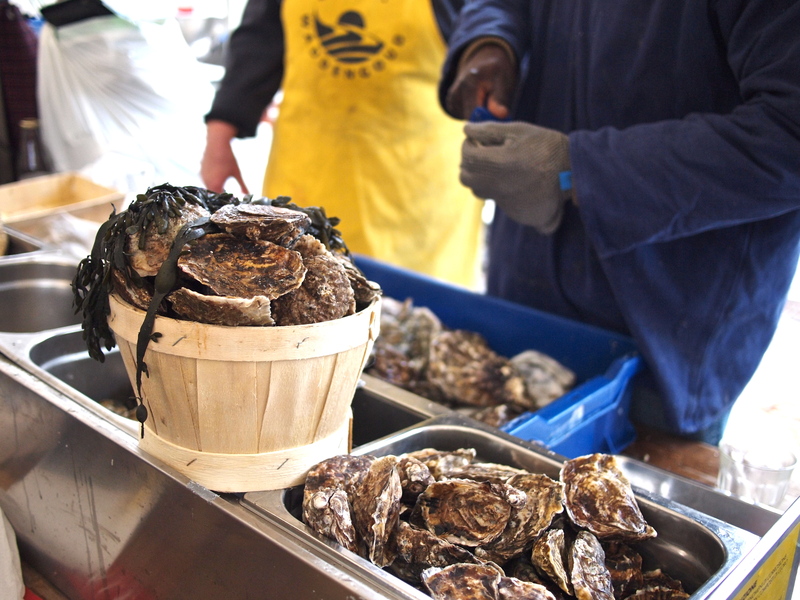 An oyster stall at the market was the perfect place to rest my feet and indulge in some tasty bites. David Hervé La Royale Cabanon oysters had a lovely sweetness that lingered forever on my palate. A young boy, who looked around 8 years old, threw back the Royale like a seasoned veteran and gave me the thumbs up sign with a big smile. 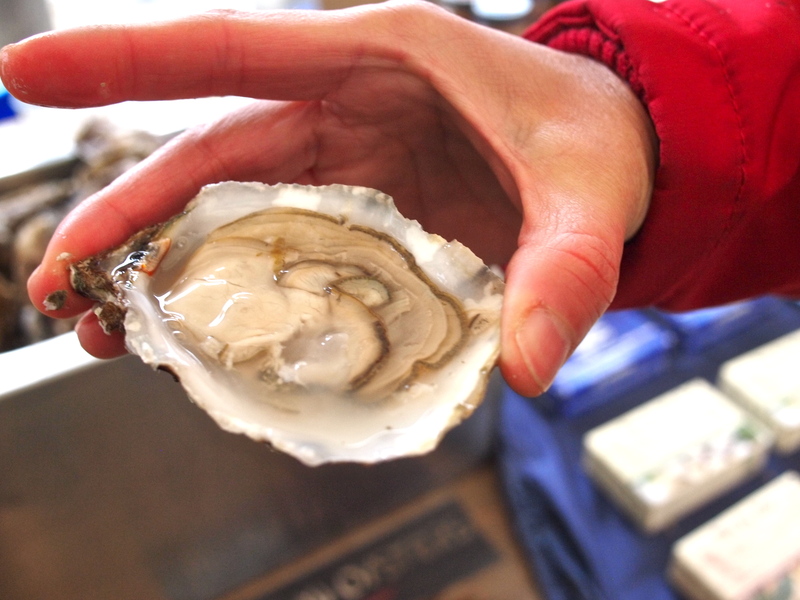 The oyster vendor recommended that we try the Umami oyster, a plump oyster that shocked me with its initial jolt of saltiness, which then gradually and slowly turned into an intense brininess with a final finish of potent sweetness. It was a powerful and vigorous oyster, unlike the more understated and elegant flavors of the Royale. 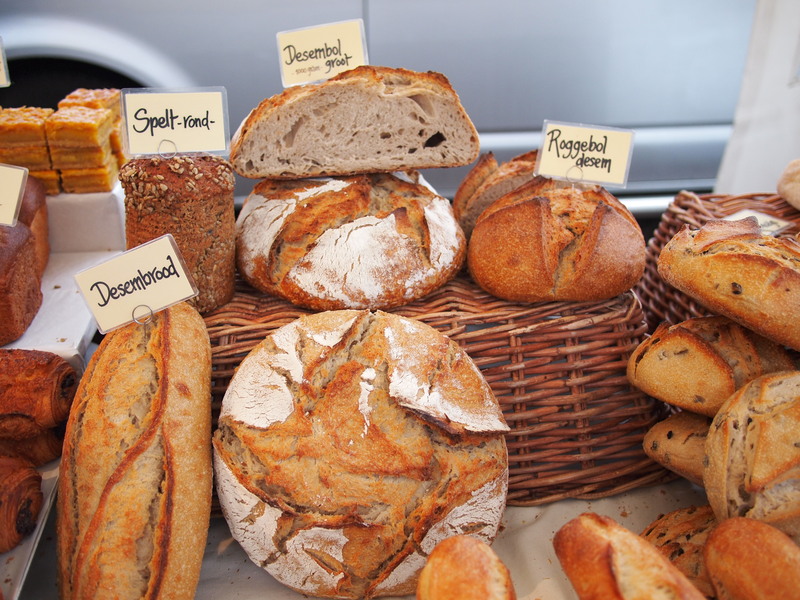 The Dutch are known for their rustic breads, and not surprisingly, there were at least 10 different bread stalls at the Noordermarkt. 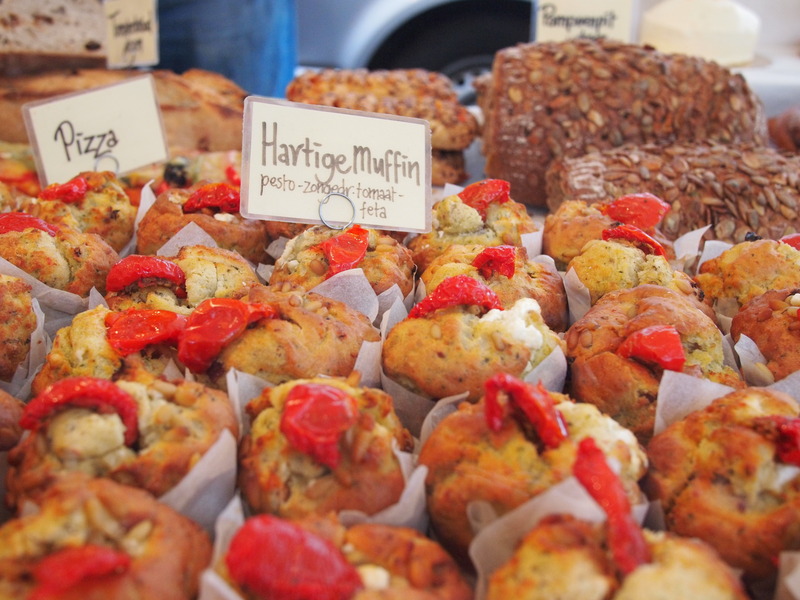 Freshly baked muffins, some topped with sweetened fruits and others with herbs and vegetables, rye rusks, whole wheat loaves, braided pretzels, heavy spelt cylinders and flaky croissants colorfully lined each counter, quickly being snatched up by hungry customers. 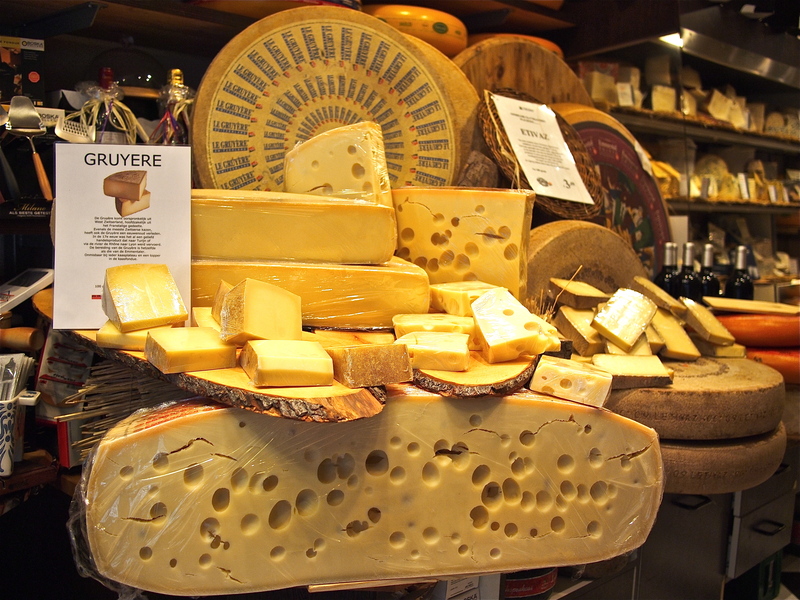 Large wheels of cheeses, from the famous Gouda to the mellow Edam, soft goat’s cheese to buttery triple cream cheese, were on display for all to see and buy, and every vendor was more than happy to guide me in finding the right ones to satisfy my palate. 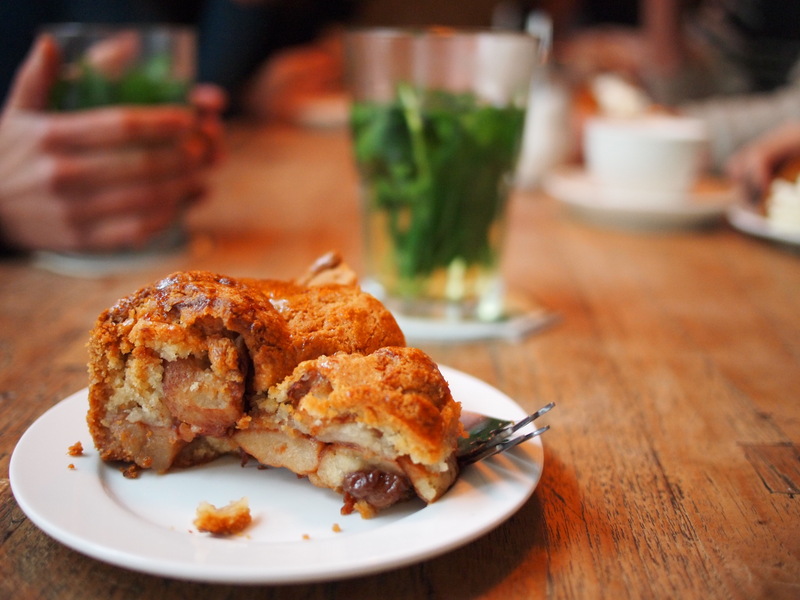 After a morning of shopping and sampling, the best way to wind down is to nosh on the best apple pie in the city at Winkel Café, situated right in the Noordermarkt square. 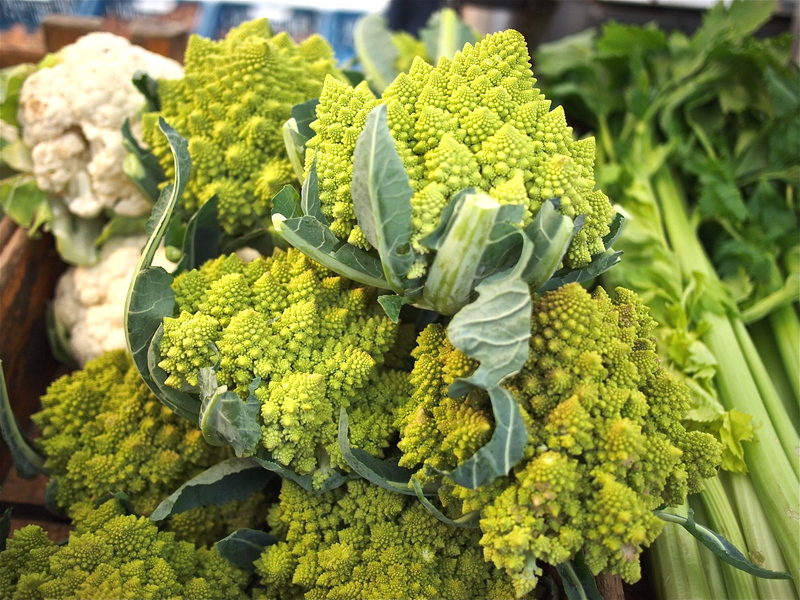 In fact, the organic farmers market got its start in 1987 when the owner of Winkel set up organic vegetable stalls in front of his café, hoping to draw more customers into his store. 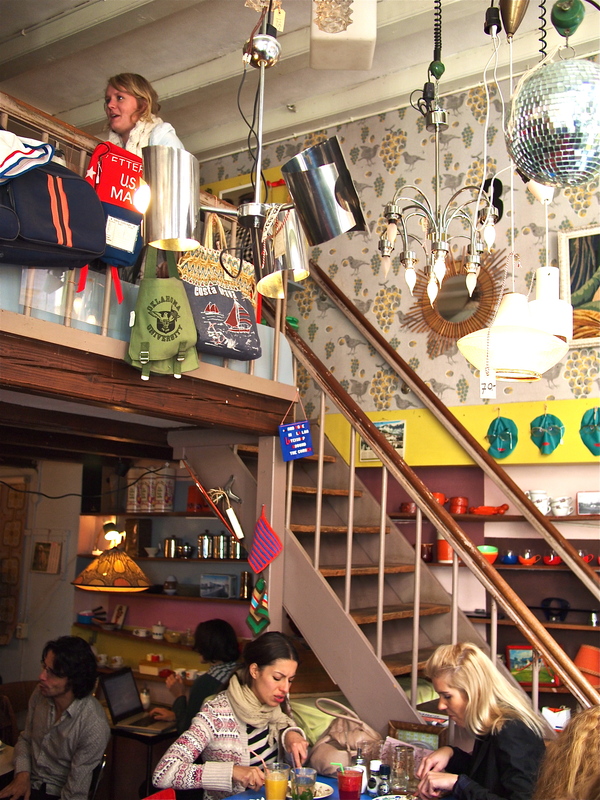 The cozy café is always crowded, day or night, rain or shine, with locals and tourists. Several Hollandse appeltaarts (Dutch apple pie) come up the dumbwaiter from the kitchen onto the main counter, warm and fresh, and served met slagroom (with whipped cream) for those wanting that extra sugar kick. 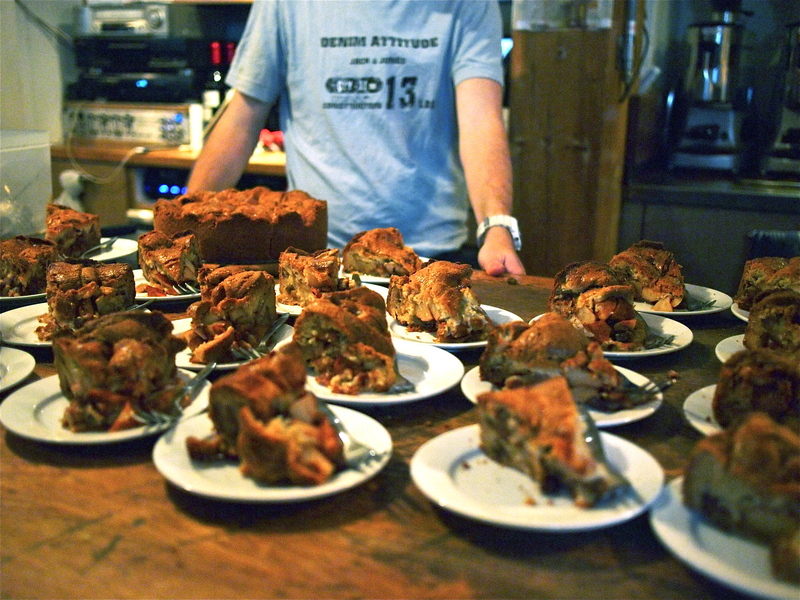 During the rush, Winkel will easily dish out up to 10 pies an hour. As the rain came pouring down on us at the end of our shopping spree, we darted into Winkel Café and squeezed into the communal table next to 10 other customers who were already licking up their pies. After warming our bodies and our hands on tall glasses of mint tea, we dug our spoons into our apple pies to experience a heavenly dessert like no other. Thick soft chunks of sweet apples coated with cinnamon, nestled inside an even softer encasing of weightless crust that was delicate yet full of flavor at the same time. No need for whipped cream on these apple pies, they were just perfect on their own. 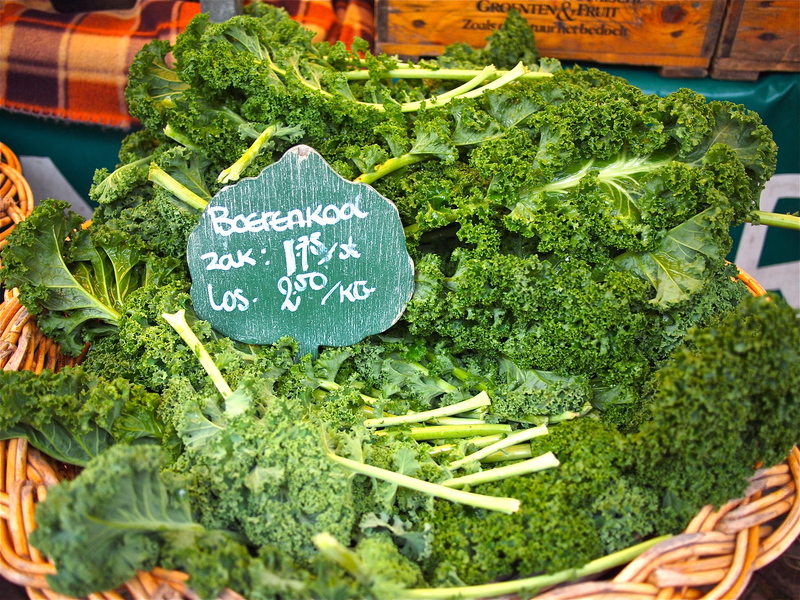 The Noordermarkt organic farmers market is on the corner of Prinsengracht and Westerstraat, and open on Saturdays from 9.00 am – 3.00 pm. Once in a while you have a meal so unique, so incredible and so special that it makes a lasting impression on your palate and makes you rethink what good food is. When food tastes wonderful, and flavors are effortlessly delicious, we recalibrate our standards by which we measure culinary greatness. 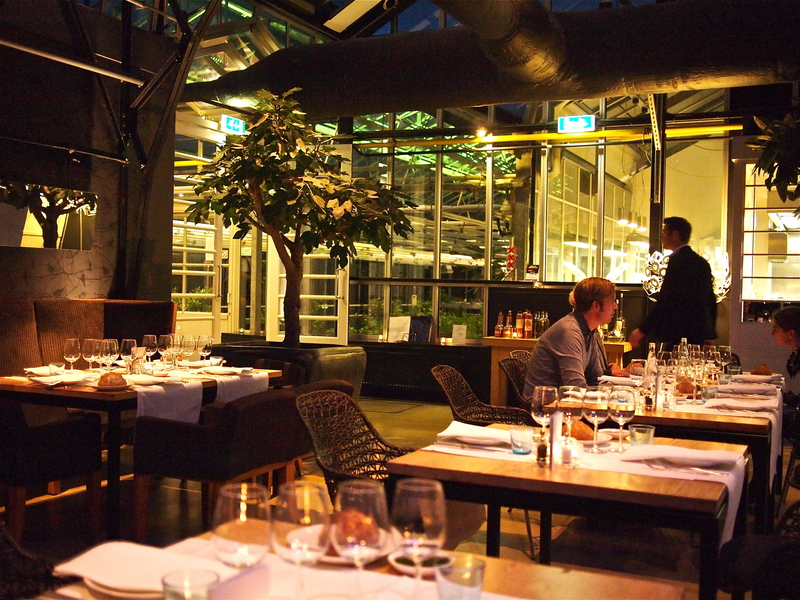 On a recent trip to Amsterdam, I visited Restaurant De Kas in the hopes of having such a life changing experience. 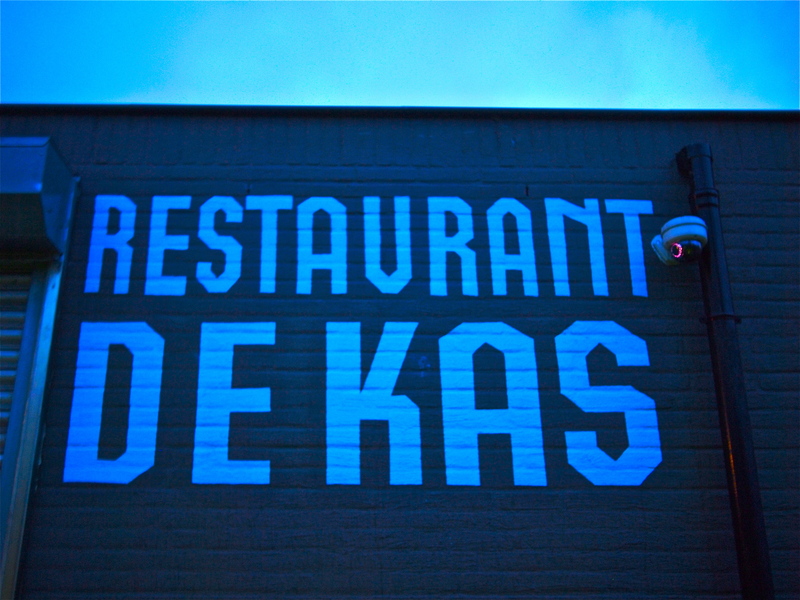 Arguably the most famous restaurant in Amsterdam, there was not a soul in the city who did not know of De Kas, and for 10 years this restaurant has been a benchmark of haute Dutch cuisine. 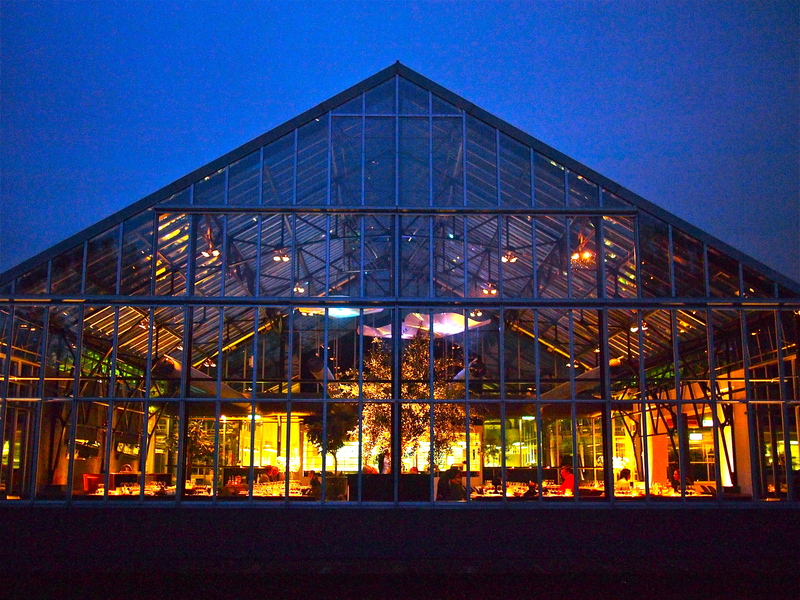 Locals were impressed that I was going there for dinner, and tourists were envious of my reservation at this reclaimed and beautifully reconstructed greenhouse that used to belong to Amsterdam’s Municipal Nursery. 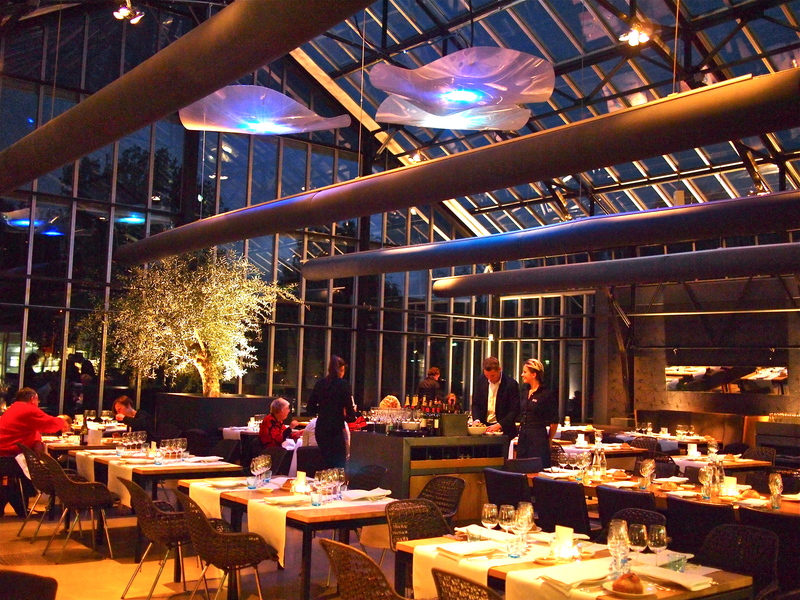 The 8 meter high glass greenhouse, which dates back to 1926, was rescued by Michelin starred chef Gert Jan Hageman in 2001 and converted into a restaurant with an adjacent nursery and gardens. 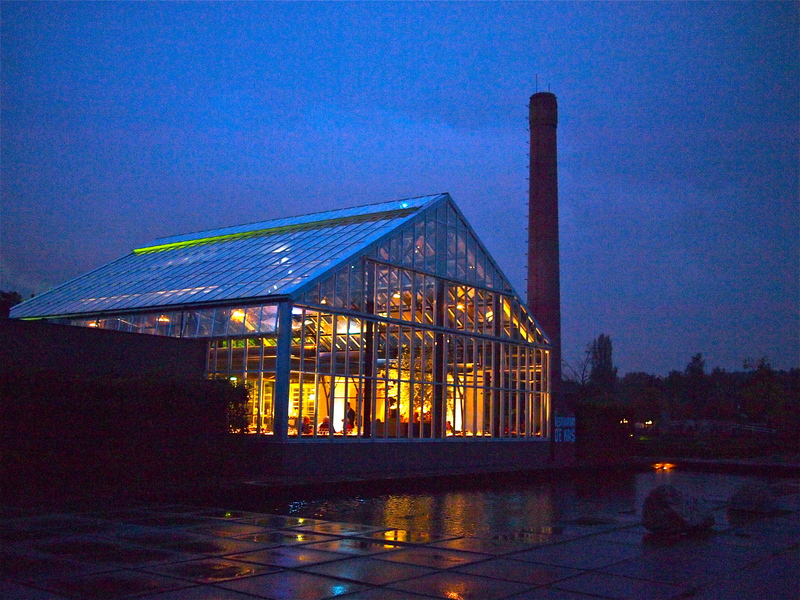 Located inside the Frankendael Park, the greenhouse stands out as a majestic building with a tall chimney as its landmark. 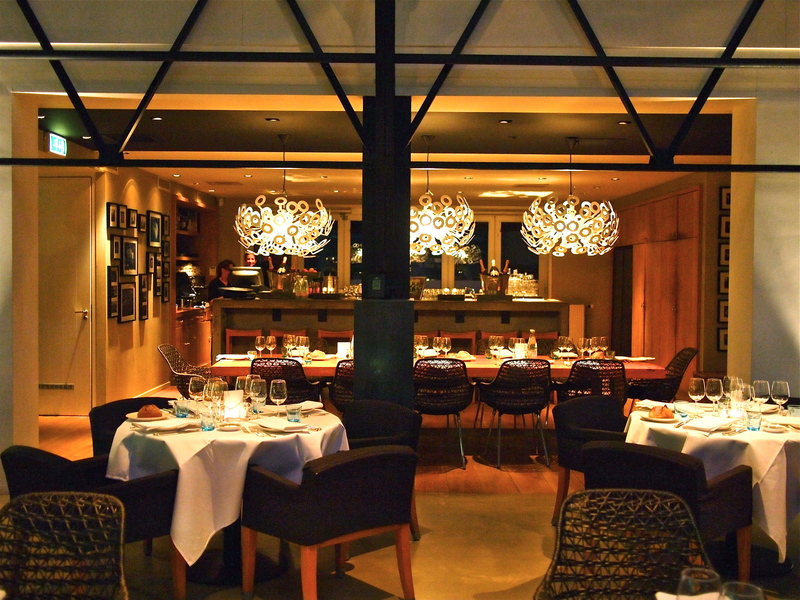 No doubt the views through the tall glass windows are stunning during the day, but on a recent autumn evening as I approached De Kas through the light mist, the warm orange glow of the restaurant against a striking backdrop of indigo blue took my breath away. 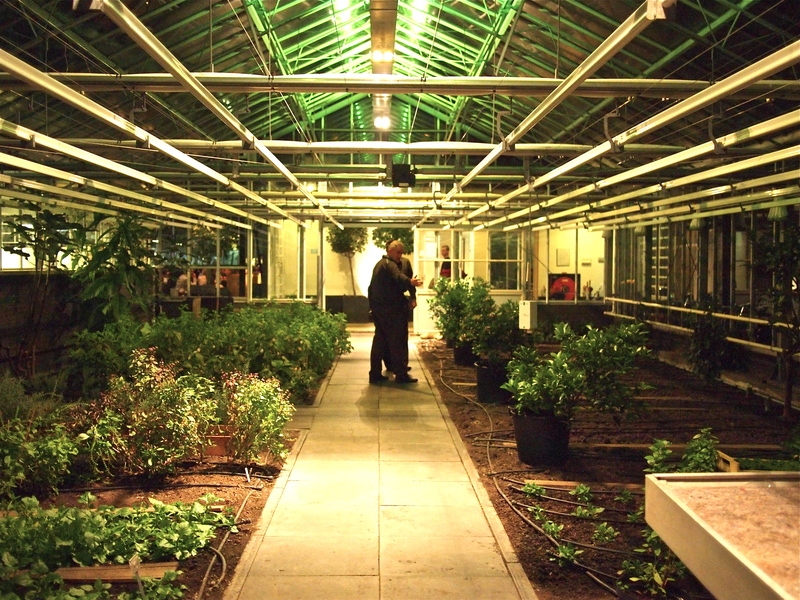 De Kas’ appeal is haute cuisine using locally grown and harvested vegetables, herbs and edible flowers, which are tended to by Gert Jan Hageman in the greenhouse and in several gardens on and close to the restaurant premises. 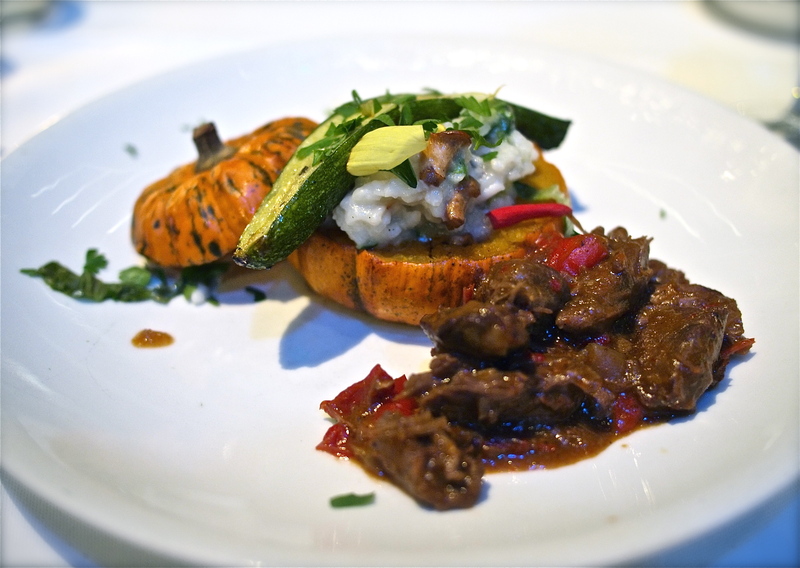 Additional produce comes from local farmers, and meat and seafood are locally sourced as well. 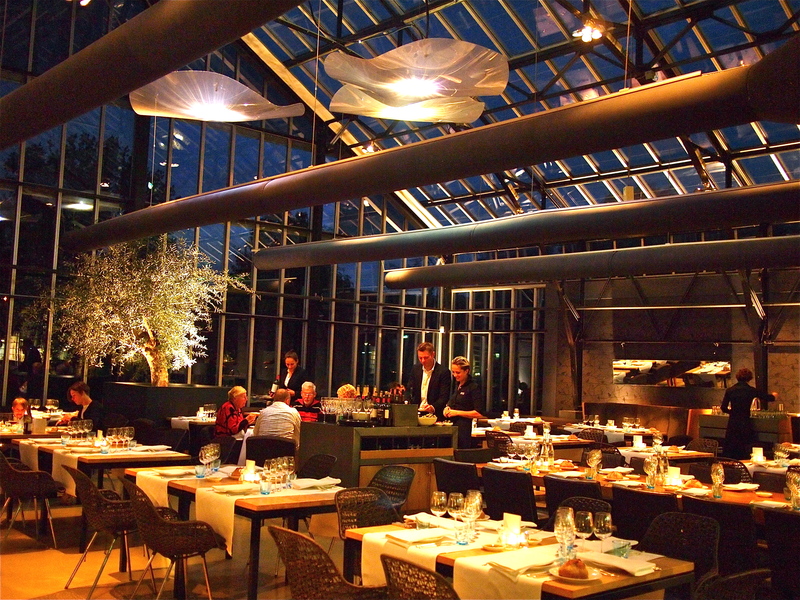 The greenhouse is the first room that one sees past the front entrance, before entering into the awe-inspiring dining room with floor to ceiling glass and beautifully lit trees interspersed between tables. While the room is spacious, every seat has a clear view of the semi-open kitchen. Both lunch and dinner are prix-fixe menus, lunch with 4 courses for 37.50 Euros, and dinner with 5 courses for 49.50 Euros. A small 4-person chef’s table inside the kitchen offers a 10 course meal for 125 Euros and an up-close and personal encounter in the heart of the action. With such a compelling story, a rich history, a stellar reputation and an intriguing cooking statement, I was sure that I was in for a unique experience that was going to change my perception of food. Little did I know that I was in for a uniquely disappointing experience. 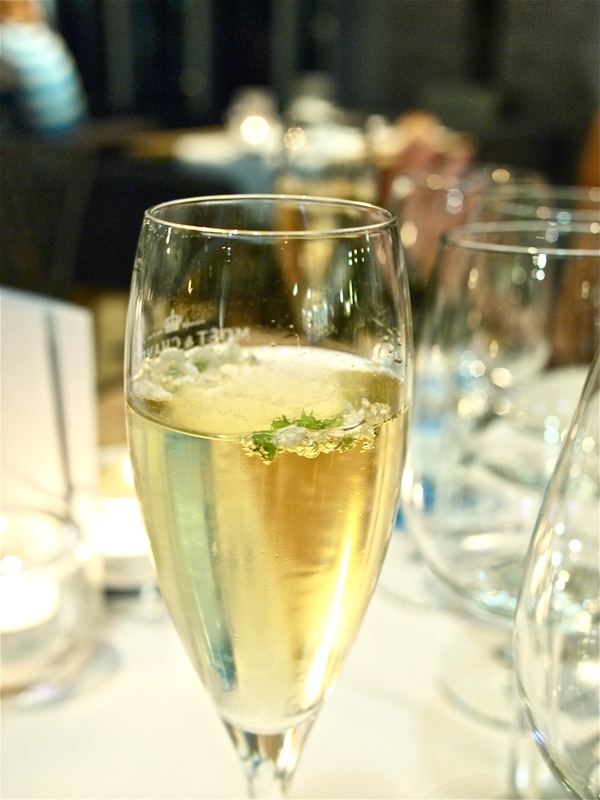 It started with a glass of champagne, chilled, bubbly and golden yellow. What a clever idea to float basil flowers in champagne- nobody has ever done that, I thought, but the first gulp sent a caustic bitterness that stung the surface of my tongue. It didn’t seem right, and the champagne stopped tasting good, but I passed it off as my lack of ability to appreciate the combination. 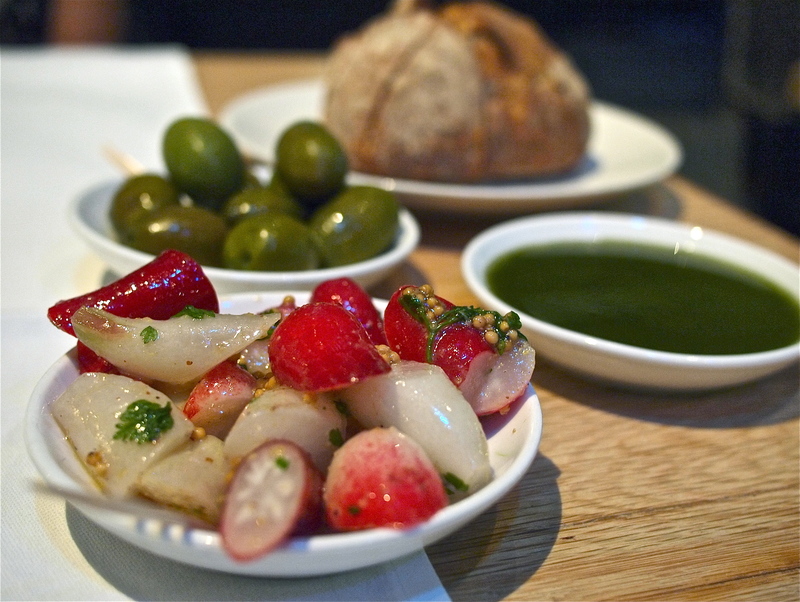 Starters of plump green olives and bitter radishes marinated in herbs and mustard seeds were good, but the basil oil for dipping their bread had the same unpleasant bitterness of the flowers in the champagne. The basil oil that I make at home never tastes this acrid, I silently thought to myself, but I am not a professional chef and surely I must be wrong. 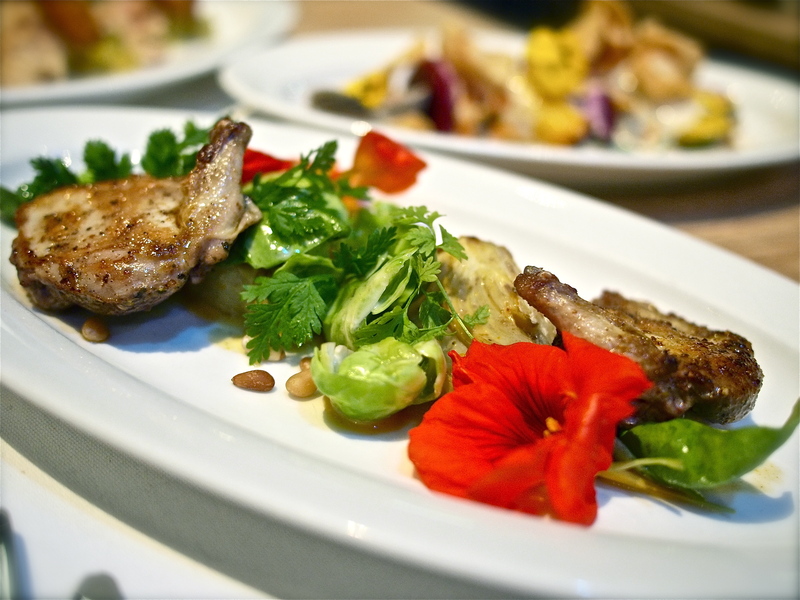 Pan seared quail, cold and underseasoned, was served with thick fennel shavings, practically raw brussels sprouts, edible flowers, parsley and pine nuts. The curry flavor on the quail disagreed with the bitterness of the flowers, and I didn’t quite understand whether the raw roughage was intended for texture or flavor, as it did little to prove more than its function for color. It was around this time that I noticed my dining partner sharing the same confused facial expressions, but we both smiled in silence for fear of admitting that it was our palates in question, and not the food. Tender red beets and gorgeous yellow carrots were generously coated with a sweet vanilla sauce, a seemingly logical combination of sweet on sweet, but tossed with cold clams and cockles, it took a hairpin curve in the wrong direction. Crispy carrot chips, random leaves of spinach and bitter edible flowers were thrown into the mix, with the vanilla cream sauce the only seasoning on the plate to feebly attempt to bring everything together. A subtle squint of disapproval shot across the table, initiating a silent conversation between the two of us- is it, perhaps, the food? A deep fried chunk of celeriac root adorned with yellow edible flowers unabashedly sat on a raucous carpet of coarsely chopped gherkins mixed with mustard seeds, soggy apple salad and whole almonds. 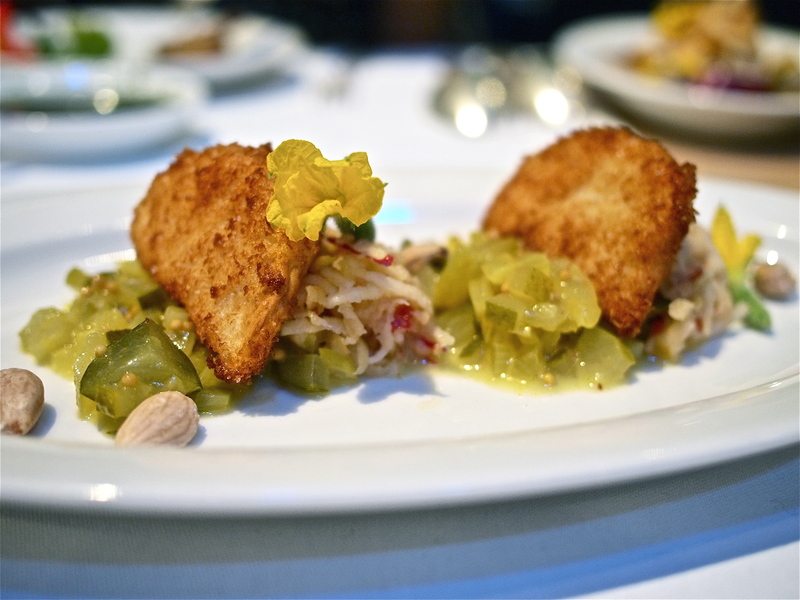 Breaded roots with chopped pickles at a fine dining restaurant- this concept finally broke our restrained silence, and like an avalanche, our concerns, complaints and disdain came pouring out in an uncensored confessional. It is De Kas, it’s not our palates. It was the first time in my life that I ever struggled with a palate identity crisis, and the weight of vacillating self-doubt nearly crushed my confidence. Risotto stuffed in a roasted miniature pumpkin resembled nothing of a risotto, but rather soggy Asian rice overcooked with water, the underseasoned pumpkin, zucchini, endive and chanterelles contributing little flavor to the bland concoction. Veal stew lacked the gusto, depth and heartiness of braised meat, and I found myself paralyzed with disappointment and confusion at what tasted like fancy cafeteria food, at best. 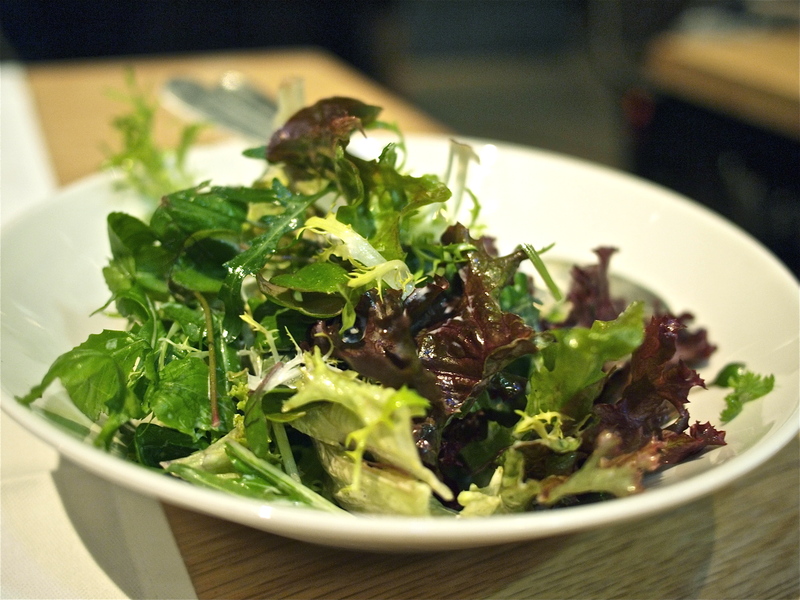 Even the farm greens in the salad De Kas, dressed with an uninspiring vinaigrette dressing, were lackluster and irredeemable. 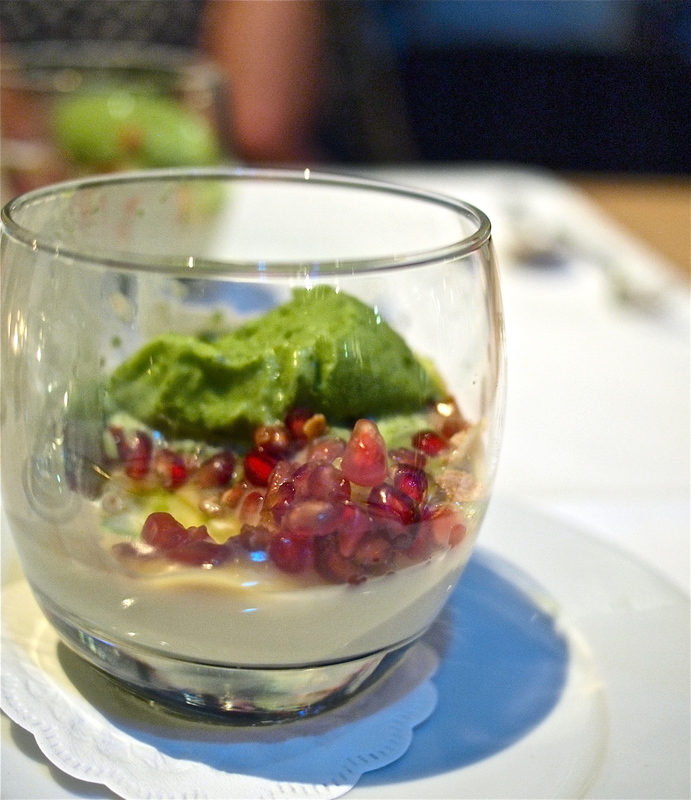 Lemon panna cotta topped with pomegranate seeds, melon and an aggressive basil ice cream finally convinced us that it wasn’t just a bad night at De Kas- it was their style of cuisine. Despite my heightened expectations and hopes for an exceptional experience at De Kas, I found the dinner to be generally bland, and the flavor combinations to be both odd and off. Unable to force ourselves to eat more than 2 bites of each dish, our server and the manager approached us at the end of our meal, asking what was wrong. While my dining partner could not help but be blunt, stating that the meal was awful, I tried to follow with compliments on the beauty of the dining room and the attentiveness of our staff before admitting that the food was not palatable. This was met with disapproval of our opinions and criticism of our palates, as they tried to explain how the restaurant philosophy was to use as little seasoning as possible to highlight the natural inherent flavors of the vegetables. Most restaurants in America are used to oversalting and overdressing vegetables, which is why you don’t like our food, they argued, as I held back my comments in order to gracefully end the dispute, all the while flipping through gustatory flashbacks of sweet succulent vegetables from the Santa Monica Farmers Market and the delicate beauty of minimally seasoned Kyoto turnips. I had come full circle by the end of the dinner, regaining complete confidence in my palate. ‘Once in a while you have a meal so unique, so incredible and so special that it makes a lasting impression on your palate and makes you rethink what good food is…’ This experience at De Kas did just that, only in a way that I never expected. Random trivia: Did you know that the largest pumpkin ever grown weighed 1,140 pounds?